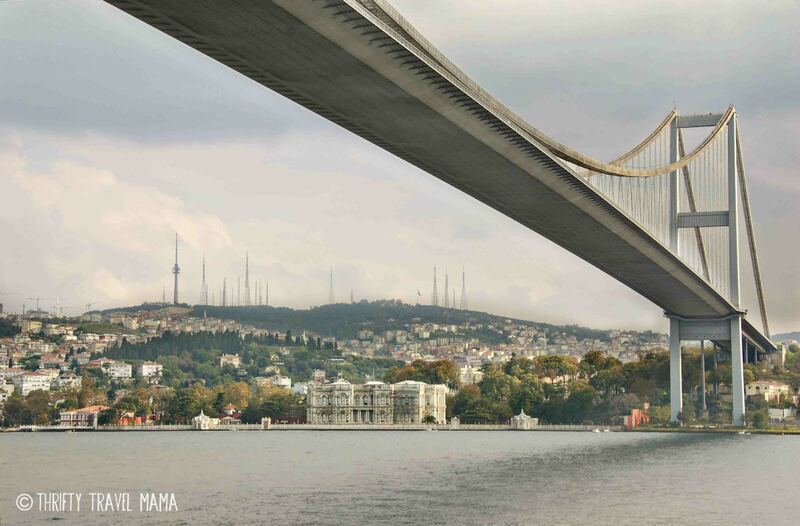 Have you smelled the salt in the air and felt the press of the crowds while virtually bopping around the Bosphorus and ancient city of Istanbul with us? 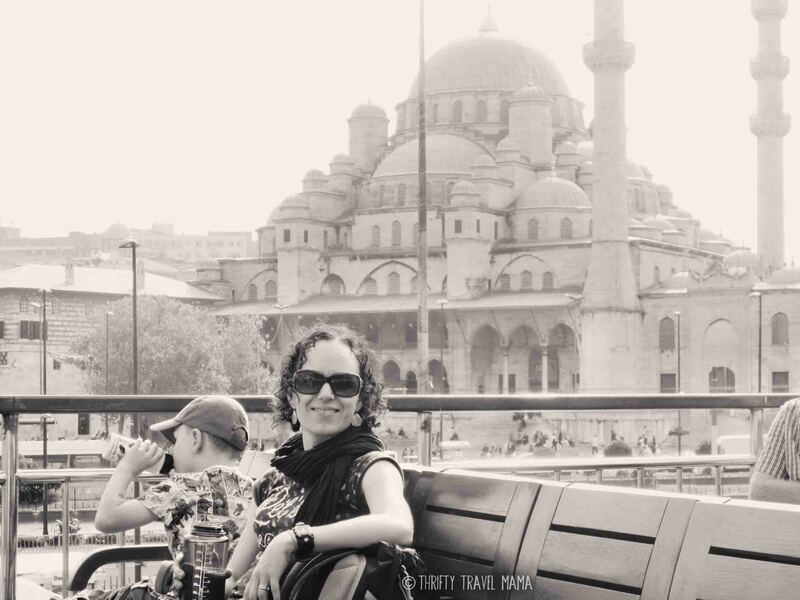 I’m wrapping up our Turkish Family Travel Adventure series today with my top ten tips for making your own trip to Istanbul both budget-friendly and a smashing success! Get an e-visa. The majority of travelers will need a visa to enter Turkey. Unlike other countries with arduous processes (ahem.. Russia), obtaining a visa to enter Turkey is relatively painless and can be done online in advance here. Bargain with your hotel to include breakfast and a ride to or from the airport. Nearly every hotel I looked at (and believe me, there were scores I researched), offered free breakfast. Many also offered a one-way private transportation from the airport (Atatürk – not Sabiha Gökçen) with a stay of 3 nights, and a return service with stays of 6 nights or more. It is possible to get to Sultanahmet from Atatürk via public transportation, but I would not have wanted to do that with the luggage we had from moving to the US. If you’re leaning toward DIY or your hotel won’t budge even when you pit different properties against each other, check out this comprehensive guide to your options as well as tips on getting from Sabiha Gökçen to Sultanahmet. You should know that even if you have a private driver waiting for you, finding him in the insane arrivals hall will be your first taste of the frenzy that awaits. Pick a hotel in Sultanahmet or the Galata Tower (Beyoğlu) area. By staying in one of these two areas, you’ll be within walking distance of as many sites as possible. When researching accommodation options, I (erroneously) thought that the Galata Tower area was too far away from most of the places I wanted to go. I didn’t know about the T1 tram or how easy it is to use. For an overview of the pros and cons of both areas, click here. For where not to stay, click here. Avoid bringing a stroller if at all possible. Istanbul isn’t known as the City of Seven Hills for nothin’. A simple walk from your hotel to the nearest tram stop becomes a tad more treacherous when you add a San Francisco-style grade to the route. If you do bring a stroller, you’ll likely save the kids’ energy but burn your own going steeply up and down all day long. It is possible to get on and off trams with a pram, but metro stations are more tricky to maneuver since most have stairs instead of elevators. Discuss cultural and religious differences in advance. Unless your family is well-versed in Muslim culture, your kids will likely ask questions about why the women have their heads covered and why they hear the azhan (call to prayer) broadcast over loudspeakers five times per day. Encourage them to ask questions, find commonalities, discuss their thoughts, and learn about local traditions and customs like bargaining. Also, It’s always courteous (and fun!) to learn a few simple words and phrases in the local language. Practice restaurant manners and encourage an open mind about new foods. 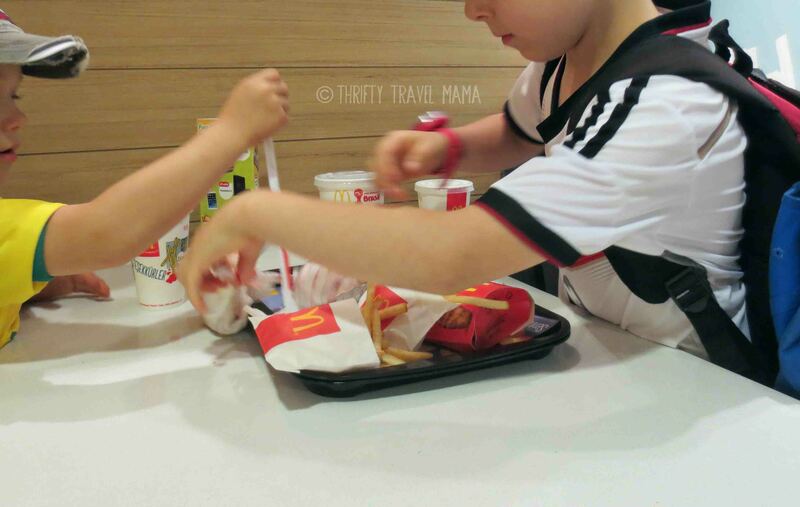 My kids rarely ate in restaurants during our four years in Germany (their parents aren’t, uh, crazy about German food), so they were a bit on the rusty side when it came to table manners and how to behave in a restaurant. Thankfully, the boys are usually pretty good about trying new foods, but I thought it would be fun to make a little game of it by encouraging them to find the similarities and differences such as how Lahmacun is like pizza or Kofti is different than Italian meatballs. Save on dinner out by sharing adult portions with your kids and declining drinks. 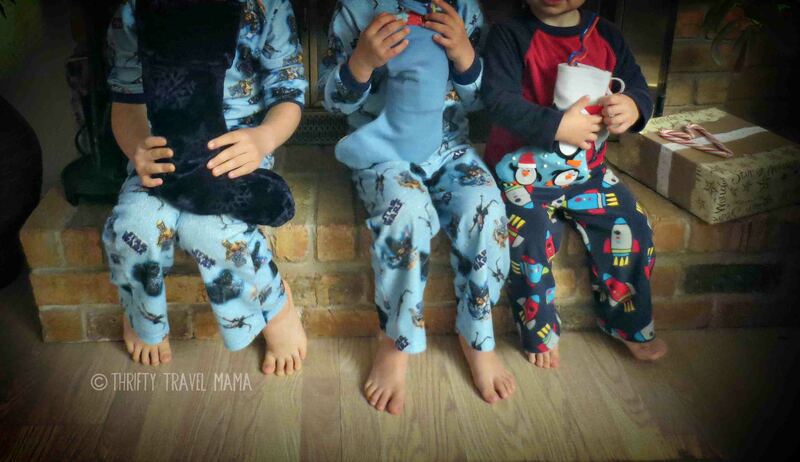 For our family of five – and our three boys already practically eat as much as we do, we often ordered three adult portions and licked the plates clean. No leftovers means no waste and no extra cash going to meals out. We figured we could always buy Turkish bagels or fresh juice if we needed a little something after the meal. We bought 5L bottles of water at local convenience stores and used these to refill our smaller water bottles at the hotel. We brought snacks with us from home instead of trying to find a supermarket in Sultanahmet (good thing, too, because – well, good luck with that). Prepare for total strangers to touch your children and offer them gifts. This happened to us in South Korea, too, but it didn’t make it any more pleasant for me or my boys. Decide beforehand what your family’s response to such gestures will be. I tried to be polite and gently decline the candy or whisk it away as soon as the stranger left. 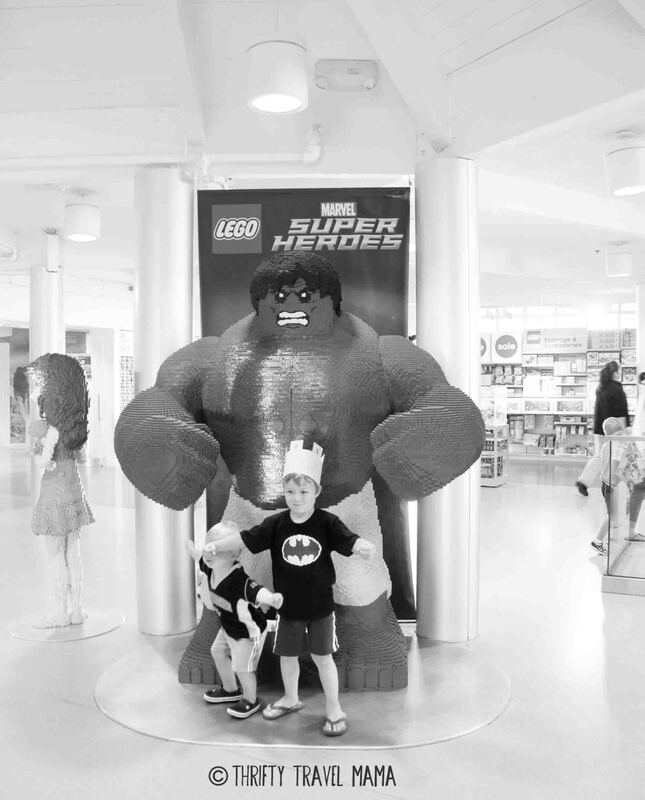 While that might have been a noble effort, in reality my kids hated being touched by strangers. Bravo smacked a man’s hand away because, “He wasn’t my friend.” Charlie was so sick of the attention that he threw down a piece of chocolate offered to him by a flight attendant. They were OVER it. Time your visits to popular sites when crowds are smaller and in the shoulder season whenever possible. 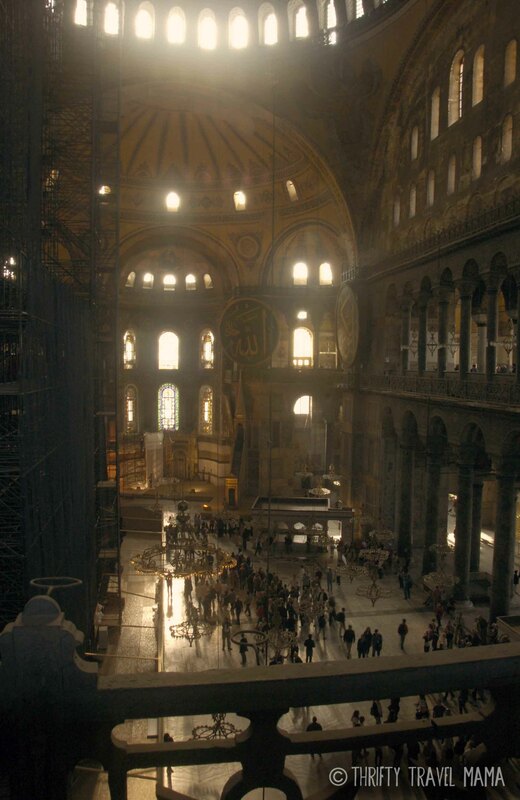 When we visited the Hagia Sophia first thing in the morning, we were joined by throngs of other travelers. But, when we passed by it in the late afternoon, the lines were nearly nonexistent. A fluke? Maybe. I would research the best times to visit each site on your list (you may be surprised what you find). And shoulder season is always a bargain.. if you can handle the cold! 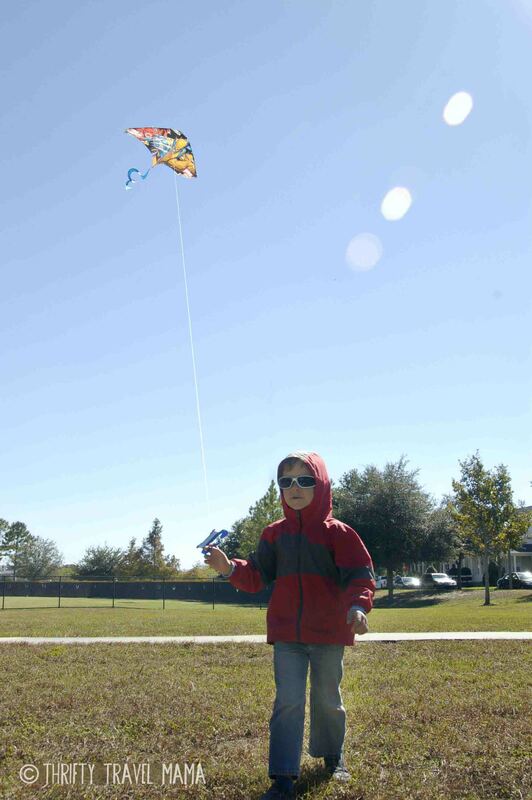 Seek out local playgrounds to reward kids and give everyone a break. The best playground we found (okay, the only one) in Sultanahmet was Gulhane Park. The large Gulhane green space was a welcome respite from the hustle and bustle of Istanbul. 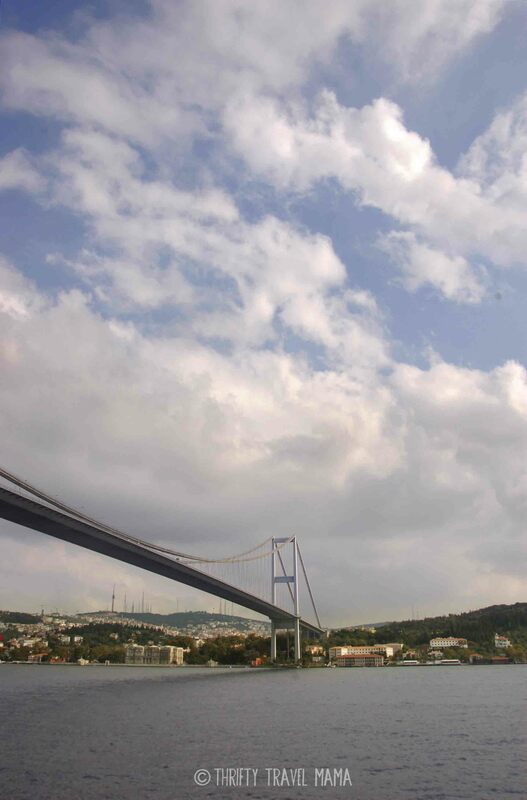 The park wraps around the north and west edges of Topkapı Palace. The Palace seemed grand from the entrance, but that’s as far as it went for us. Yes, I know you you can peek into the sultan’s harem for an a token admission fee, but we preferred to enjoy the fresh air and rare opportunity for the kids to run free. By the way, there’s a lovely tea garden on the far (north) side of the park overlooking the water. 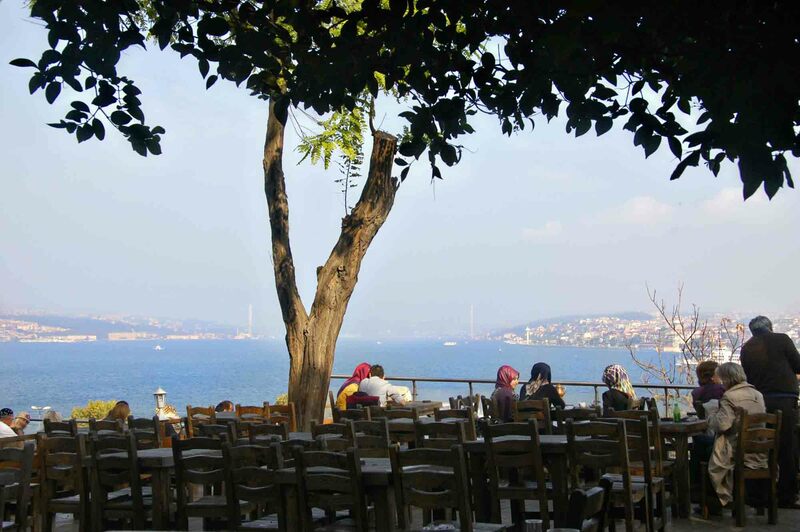 The tea service itself is pricey by Turkish standards, but the view is absolutely free. If you’re counting, you know we’re at 10 already, but I thought I’d toss in one more tip of a more serious nature..
Have a plan for what to do in case your family gets separated. It’s no secret that Istanbul is incredibly crowded. Getting on and off trams and subways can be squishy business, and tourist buses can unload and overwhelm a site in an instant. Decide what to do if you get separated from one another, and know emergency numbers and phrases. You made it through all the tips (yeah! ), and now you should have a better idea of what to consider, research, plan and look out for while in this crazy middle-eastern city. 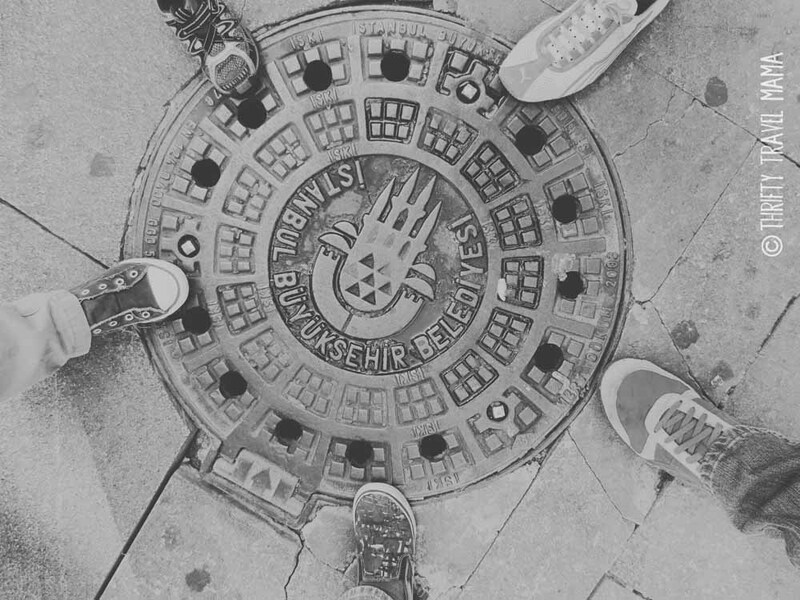 ‘Tis true – Istanbul is loud, smelly, and intense. It is NOT a destination for those seeking rest and relaxation, though I hear Turkish beaches are well-suited for such purposes. However, don’t let that discourage you from giving Istanbul a go; there’s lots to love and gems to be found in the middle of all that mayhem. Here’s to your own family’s Turkish travel adventure! 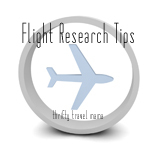 What tips would you add from your own research or travel experience in Turkey? What do you wish you would’ve known before you went or what question are you hoping to answer before you go? All images are mine except the first one (credit). 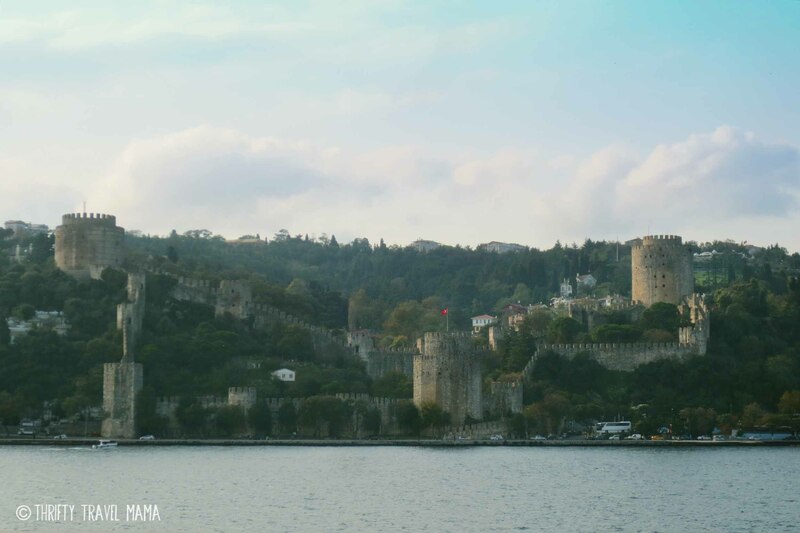 This post appears as part of our Turkish Family Travel Adventure series, chronicling a fun fall fling in the city of Istanbul… well, except for the hotel shenanigans I’m sharing today. 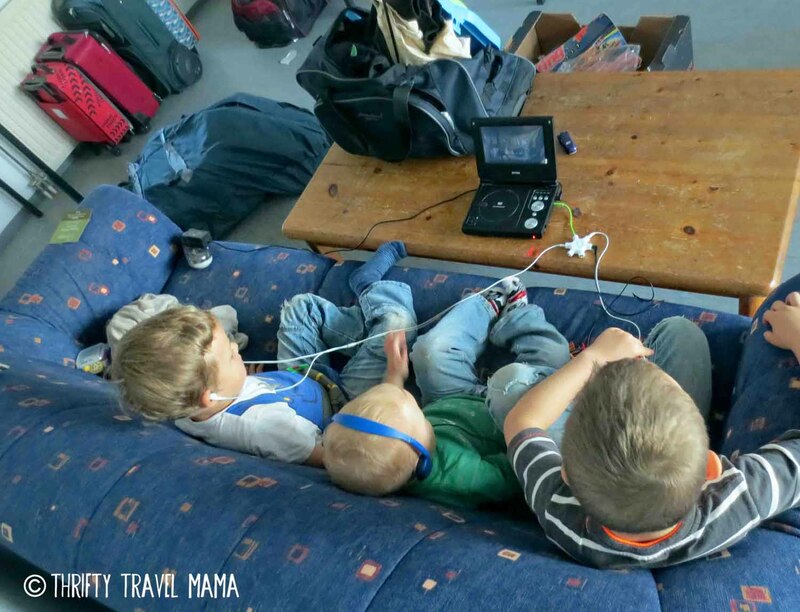 It’s obvious from comments both written and spoken that some people think the life of an expat or long-term traveling family is one of endless glamour. It must be amazing to see so many places in the world! You are so lucky! I wish I had your life! Hmmmm. 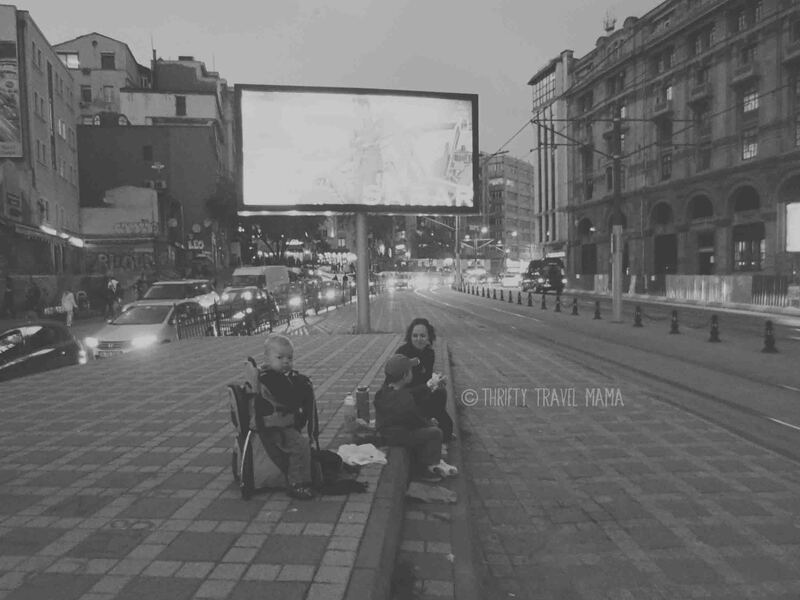 I think the travel blogging community doesn’t do enough to show the other side of travel. You know… the my-kid-threw-up-on-the-train-and-we-just-had-to-leave-it-or-miss-our-connection side. The diaper-blowout-that-coated-the-entire-car-seat-at-4am side. The I-so-looked-forward-to-this-place-but-it-totally-let-me-down side. I’m definitely an accomplice in this only-show-the-pretty-side routine. It’s not that I want to purposely hide anything. It’s more that I prefer to write about the fun times and often forget to write about the travel disasters. 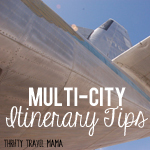 So, today I’m sharing a bucket list FAIL and a nasty hotel mishap that nearly ruined our trip. 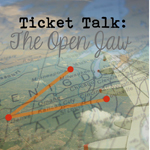 You can read more about our mishaps and total travel fails in Italy, Bulgaria, Karlovy Vary, and Seoul via the links provided. You’ve probably seen my bucket list here. The last item on the list is something I’ve never done before – visit two continents in the same trip without flying between them. Fortunately, this is easily done in Istanbul… if you have time. But, time we did not have. Sadly, we could only sail between Europe and Asia, touching the former but not the latter. All in all, not a super big deal. Plus, it means I’ll have to go back. Three cheers for silver linings! Now, on to the dark cloud.. Normally we stay in vacation rentals when we travel. They’re cheaper, provide more space than a traditional hotel room, and give us the opportunity to imagine living in the city. I had a terrible time looking for accommodations in Istanbul. 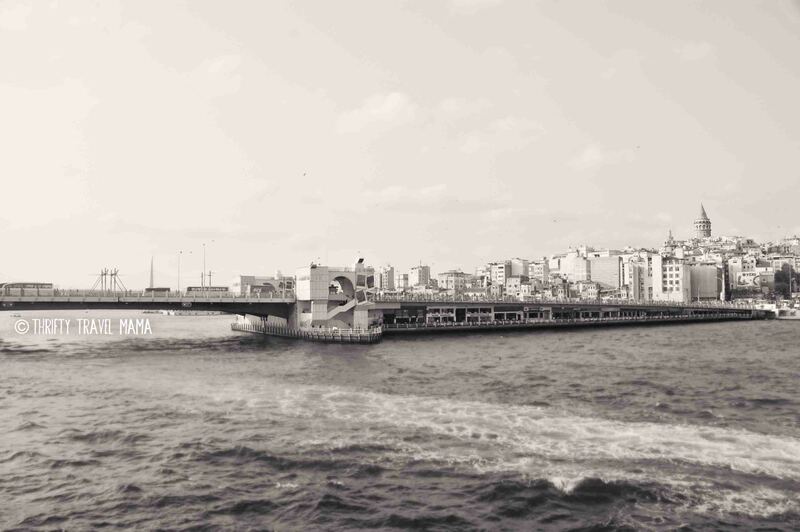 It seemed that all of the apartments were in Galata – or much further away. I wanted to be within walking distance of as many places as possible in Sultanahmet since we only had three days. I had no idea (and had no time to research because we were moving) how we would do on public transportation, and I didn’t want to risk it. Numerous searches did not turn up any apartments that fit my criteria – and yes, I continually loosened my expectations over the weeks I looked for a place. Finally, I had to fact the facts – a holiday apartment was out. Time to look for a hotel. Many of the hotels looked ridiculously run down, shabby quarters with royally high prices. We needed a cot of some kind for Charlie at least two double beds for the rest of us. I hoped for a door of some kind to make the room a suite so that Doc Sci and I could hang out at night while the boys went to sleep. A kitchen is also a huge plus for us. The hotel rooms my search returned were both depressing and hilarious. Some of them were decorated with antiques in a rich, granny style which is fancy but never feels clean to me. Others appeared so cheaply put together and dirty I could easily imagine the grime and the bugs (not pictured, of course). My absolute favorite was a “family room” (their words, not mine) sporting a double bed and a single bed in one room… both were nestled in the main room next to a hot tub with neon lights. Just – wow. I finally found a hotel I thought could work. The Hotel Enderun featured a beautiful breakfast area enclosed in glass and a small green area perfect for little boys to let off steam in a stressful new city. The rooms did not have kitchens, but I figured that we would not need to cook when staying only a few days. Having breakfast provided would be enough for 1-2 meals a day (we usually make sandwiches with buffet items). The description on the website stated that the Family Room (the language suggests they have only one) had two connecting rooms, one with a double bed, and the other with a single. However, the photos showed two singles and one double. Either way, that would work for us – and it had a DOOR! After all, that’s what connecting means, right? When we arrived, we were shown to a regular hotel room (ONE room) that had one double bed and three portable cots. Yep, this hotel expected my big boys to sleep in baby beds. Even worse than that, they completely lied about the description of the room. Family Connected Room has 2 Connected Rooms each other. One of them has 1 Single beds and the Other Room has 1 Queen Bed, Private bathroom with shower, Dual action (heating and cooling) air-conditioner, 24 hour hot water,Satellite LCD TV with major European channels, Direct dial telephone, Mini bar, Hair dryer, Safe deposit box,WI-FI, Free internet connection. Buffet Breakfast, Non Smoking. Maximum 3 Person per room in existing beds. At first they were “full” and then they suddenly had an extra single room next to that “family room” that they could give in addition to the room we currently had. But, my kids are too young to sleep alone in a strange hotel in a new city, and I didn’t feel comfortable going in the hallway in the night if they needed us. Plus, this was NOT what I booked. The manager on duty finally admitted that the room we had was a “deluxe” room – great, but NOT what I booked. I can handle a lot of stressful situations but being tricked and ripped off is not one of them. After a bunch of “But, we’re full..” garbage, I was finally allowed to see a suite – again, not the same as the photos. I was assured nothing could be done that night. And I assured them I would not be paying the quoted rate for that night. We had no choice but to sleep in the room offered or be on the street that evening. 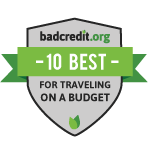 I paid half of the nightly rate and also negotiated a free return taxi to the airport at the end of our stay. The next day, we finally were able to see what was supposedly the advertised room (“It’s our best room! You’ll love it!”). Want to guess what we found? Inside were one double, one single, and one roll-away bed (NOT four real beds). There were indeed two rooms at one time, as in probably a hundred years ago, that now are one big room with a six-foot opening in between. Once more, c’mon, let me hear it… NOT WHAT I BOOKED!!!! I was – naturally – furious. But what could be done? Either I could accept this room and make it work, or I could let this ruin the rest of my vacation. Unfortunately, the photos of this fake room are still up on the website. I know now that these are photos from various rooms, not one room, put together in a slideshow to lead the customer to believe they’re getting something that does not exist. I know this because I’ve been in these rooms. The bathroom pictured is from our first room (the one with three baby cribs for three big boys). And several of the other photos are from the other family room I was shown, but that we did not stay in. I write about this not to shame a particular hotel (though that is an added bonus), but to caution you. If something seems too good to be true, it probably is. In this instance, the price wasn’t outrageously high or low, and nothing about the website seemed sketchy. I wish I would have had a backup plan so that when I was offered a room at another hotel, I could’ve had something to bargain. False advertising?! Language translation error?! Who knows – what I do know is that I wasted hours on this mess, and it nearly ruined our entire vacation since we had to deal with this garbage on two of our three days in town. If blatant misrepresentation happens to you, do not be afraid to call management out on the error and negotiate terms to make the stay acceptable to you. These infuriating shenanigans are part of that less glamorous, least-publicized, rarely discussed side to travel. These kinds of situations are the mishaps that make a place memorable – for better or worse. What about you? Have you ever bumped into false advertising on your travels or had another mishap nearly ruin your trip? What would you do if what you got was not what you paid for? All other images are from and link to the Hotel Enderun website. 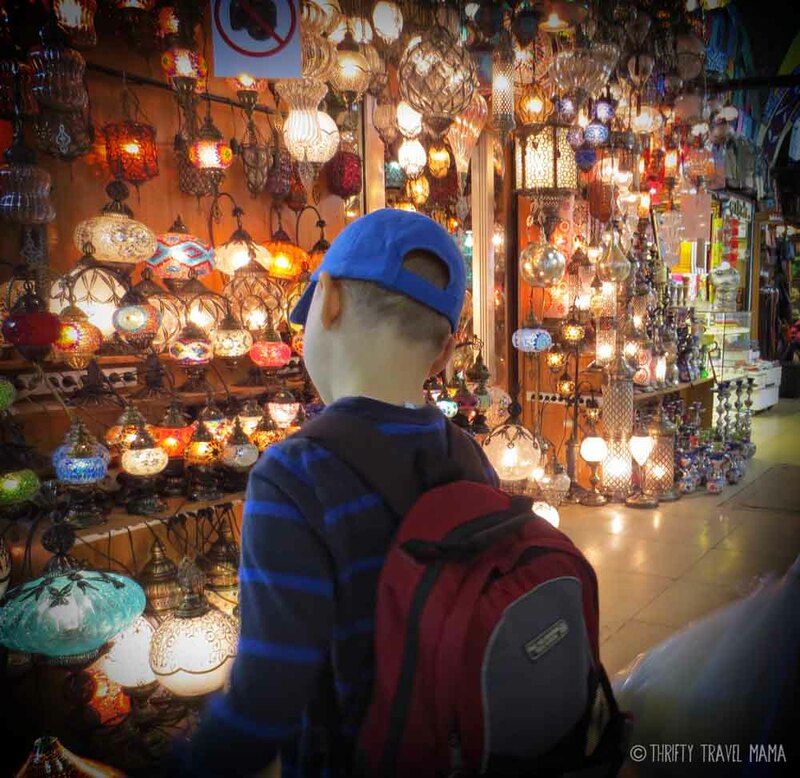 Getting ripped off is one sure-fire way to ruin your holiday, and the Grand Bazaar is the best place in Istanbul to do just that. Middle Eastern cultures are famous for haggling, the custom of arguing over a price before agreeing on the final amount. True, it’s much more work than buying items at fixed prices. But, when in Turkey, do as the Turkish do. The problem is that if you’re reading this, you’re probably not Turkish which means your Turkish haggling skills probably leave much to be desired. So, how do you learn to bargain like a pro and avoid handing over too many Liras to a smooth-talking shop owner? That was the very question I needed to answer for myself. 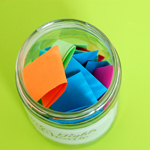 I scoured articles, posts, and guide books for the best tips. Some of the advice was contradictory (be the first customer – no, you should be the last!). But, surprisingly, most of the suggestions worked like a charm. 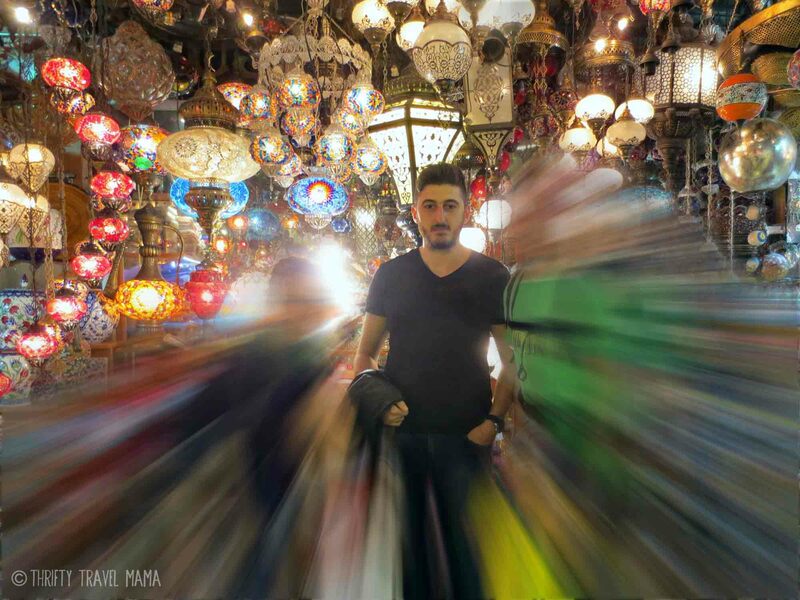 Read on to find out how you can get the best prices in the Grand Bazaar. Haggling with experienced merchants is not for the faint of heart… nor for those hungry or in a hurry. Set aside a fixed amount of time you are willing to devote to a shopping excursion. Eat a decent meal beforehand, and bring sustenance. Trust me, you do not want to go into this hangry. Also, if you’re somehow able to secure a map of the Grand Bazaar, this will help you find your way out of what should really be dubbed the Grand Maze. I have two absolute favorite Middle Eastern artisan objects – lanterns and decorative plates. I knew I wanted to buy several lanterns and at least one plate to adorn our new home (wherever in the world that ended up being). I wasn’t sure what else I wanted to buy, but I was fairly certain I could skip the tchotchkes and cheap imitation designer clothing. If you don’t know what you are looking to buy in the Grand Bazaar, I highly recommend browsing the shops. Preferably, this would be on a day or during a time other than that which you’ve set aside for actual shopping. Without this step, you may find yourself obligated to take home that shimmery belly dancing outfit and matching sultan costume. Okay, so you’re well-fed and armed with your list plus a fistful of Lira. Time to start bargaining, right? Ask the price of an item you do NOT want first. Ask the price of an item different from the first, and preferably smaller and/or cheaper. Ask the price of the item you are actually interested in buying. Politely thank the proprietor, and walk away. I repeated this in multiple shops until I had an idea of the going rate for lanterns that I liked. In the questioning phase, I learned valuable background information such as the different metals used for making lanterns and that blown glass lanterns are of better quality and more expensive. I also was able to look at a wide variety of lamps that helped me narrow down the options and know exactly what I wanted to buy. Expert tip: Avoid the shops that advertise “Fixed Price.” These shops are designed for tourists not skilled in bargaining who just want to pay a certain sum and be done with it. You’ll end up paying much more than the items are worth. And, really, you CAN do this bargaining thing. During your research phase, you’re going to hear a lot of schmooze from the mouths of the shop keepers. Your money keeps them in business, and they are not shy about going after it. As an introvert, this really wore me down. I just wanted to browse in peace and quiet. I’m content to be ignored by German shopkeepers; but, this is simply not the way things work in Istanbul. Be polite, but firm. 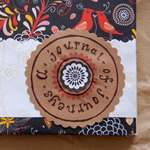 And, under no circumstances should you sit down to tea with a vendor if you do not intend to make a purchase! When you have a decent data set for your coveted item(s), decide how much you are willing to pay. However, this number is top secret and should be known only to you. Burn it into your mind, because you’re going to need it in a few minutes. Take a deep breath, and approach the merchant with confidence. Follow the first formula mentioned above, always asking about several items instead of only the one you actually intend to buy. Ask the price of several items as described in the first formula. Do NOT show special interest in the object of your desire. When he offers you a price, slash it by about 60%. The first price you offer should be lower than what you are actually willing to pay. For instance, if you thought it was worth 50, offer 40. He will counter your offer. Keeping with the aforementioned numbers, if you offered 40, he may counter 60. At this point, you can either make another offer or politely decline and either ask about another piece (starting the process over) or walk away. The second offer sometimes turns into a third offer or even a fourth. The pressure can build, and you can find yourself emotionally involved in the negotiation. If this happens, simply tell the seller you need a moment to think about it. Remember that secret price you decided on before entering the shop? It’s time to bring that number to mind. Evaluate the negotiation that has already taken place. Is the owner willing to agree to an amount less than your secret price? Are you willing to go a bit above it? Only you can answer the second question, but it’s important not to let the pressure of the situation push you over-budget. You can always walk away and try again with another shop. You can even come back later to the same merchant if no other stall offers the same piece (which actually is rather rare). The most important thing to remember is that YOU need to be satisfied with the price you end up paying. Did I get the most amazing deal on the lanterns I bought? Honestly, I have no idea. But, I do know that I talked the shopkeepers down significantly and paid what I thought the pieces were worth. Whether I got the best price or not, I’ll never know. However, I am confident I got the price that I was comfortable paying and have no regrets about my purchases. That’s what matters. This last one has nothing to do with salespeople and everything to do with little people. I’m guessing by this point, you’re thinking the whole thing sounds completely exhausting. And if you feel that way, imagine how the little ones with you are going to fare during your negotiations. Mutiny is the word that comes to mind. I highly advise talking with your children in advance about the proposed activities of the day. Explain that you’ll be looking for (lanterns), and ask for their help spotting (lanterns). Be honest and tell them that it might take a while to find the most special one for the best price. 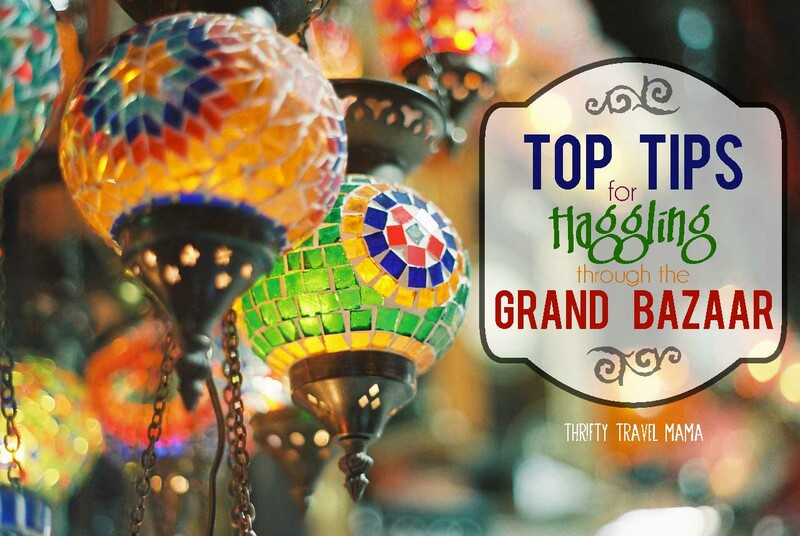 If you know how long you intend to spend in the Grand Bazaar, tell them. And then describe what kind of reward they’ll receive if they help you buy the perfect (lantern) by behaving well while you talk to the shopkeeper. We used one big reward at the end of the day (I’m sorry to say it was eating dinner at McDonalds), and several smaller rewards in the meantime. If they have a handheld toy or book, bring it. Just keep in mind that the floors of the Grand Bazaar are icky at best, so don’t plan anything that requires rolling around on the ground. Pack snacks and water. This is battle, and you definitely don’t want to go in unprepared. But, What About the Spice Market? You may have noticed that I haven’t whispered any expert tips on shopping at the Spice Market. That’s because I found it to be overly touristy with virtually no Turkish people shopping there. All the shops featured the same products; I could find nothing unique from one stall to the next. If spices are what you’re after, head outside of the Spice Market and make your way to the west side. 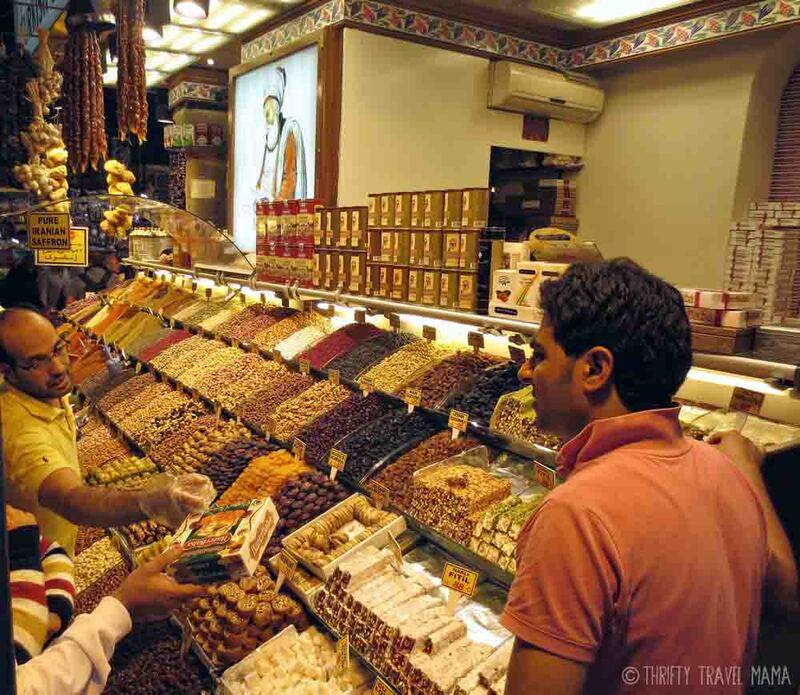 There, you’ll find more shops selling spices and other Turkish delicacies and Turkish customers. Just hold your nose – the fishy aroma is on the potent side. 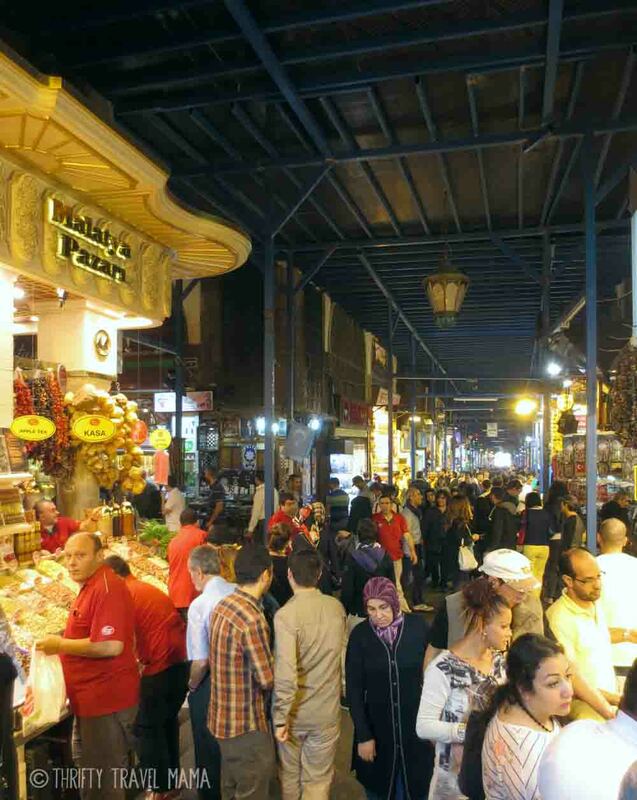 Is shopping at the Grand Bazaar as stressful as it sounds? Absolutely. There is no question that scoring the most beautiful lanterns or the most intricately decorate plates is going to be tense and tedious. But, if you know this going in, and you arm yourself with the techniques above, you can have a successful – maybe even enjoyable?! – haggling experience. There’s something for everyone in Istanbul – sights, sounds, smells, sweets and savories. The trick is finding your flavor… and on your budget. In Istanbul, neither an apartment nor a kitchen were in the cards for us. That’s just as well, though, because I only saw a few very small markets in Sultanahmet. We would’ve been out of luck had we relied on our culinary efforts alone to sustain us. Maybe you’re also headed to Istanbul and your head is spinning at all the options. You might also secretly be wondering if your kids will boycott any and all attempts to experience local cuisine, lobbying intently for dinner at the familiar golden arches. Have no fear! Here’s a quick guide to what our family bought and bit into while in Istanbul. And yes, there’s even a review of Turkish McDonalds! However, you’ll also likely be frustrated in your attempts to decipher addresses and locate that particular Lokanta that garnered gangbuster reviews on Yelp. So when you’ve had enough of everyone offering you “the best food in Istanbul,” when your feet are aching from all the miles you logged in the Grand Bazaar, and your kids won’t stop the are-we-to-the-restaurant-yet mantra, just pick a place and order one of these simple dishes. Lahmacun — Similar to a pizza, Lahmacun is flatbread topped with a combination of meat, onions, and spices and then baked. It’s often served with fresh vegetables like tomatoes, lettuce, or parsley. You can eat it like a pizza, fold it like a taco, or roll it up. Kebaps — Kebap is similar to what you might already make on your BBQ at home: skewered, grilled meat. Lamb and beef are more common but chicken is also possible. Döner – You may have seen these gigantic cylinders of meat rotating on a vertical spit at various places around the world (I first saw one in Russia). The meat is shaved and usually deposited in a portion of flatbread and then topped with vegetables and/or sauce. If you’ve been to Germany, you probably already know (and possibly love) Döner. Köfte — A main dish resembling meatballs, Köfte are often made from ground lamb mixed with breadcrumbs and spices. The Köfte are usually grilled and sometimes served with other grilled vegetables. For more well-known Turkish dishes with descriptions, I recommend checking out Witt Istanbul’s list. Most hotels in Istanbul include breakfast in the nightly rate, and ours was no exception. Turkish breakfast turned out to be quite an adjustment for us since no one was really keen on olives and tomatoes for the first meal of the day. Read up on typical morning fare you can expect while in Turkey here. For lunch and dinner, we just roamed. We did our best to find the recommended restaurants I had scribbled on my map. But, sometimes we failed, and I just picked what seemed both affordable and the least likely to give us food poisoning. Most guides tell you not to eat street food in Istanbul. You don’t want to spend your time in Turkey getting to know the toilet. One notable exception, however, is the fresh-squeezed juice. You MUST try the pomegranate. 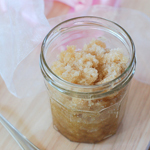 Each cup is pressed to order, and the flavor explodes – tart yet sweet – on your tongue. 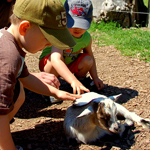 Expert tip: Start with the smallest size possible. The nectar is very strong, and you’ll want to try it before committing to a larger size. Beans & rice is one of our staple meals at home. When I found out that there’s a Turkish version, I knew I had to try it. Surprise, surprise – we loved the Middle Eastern twist! 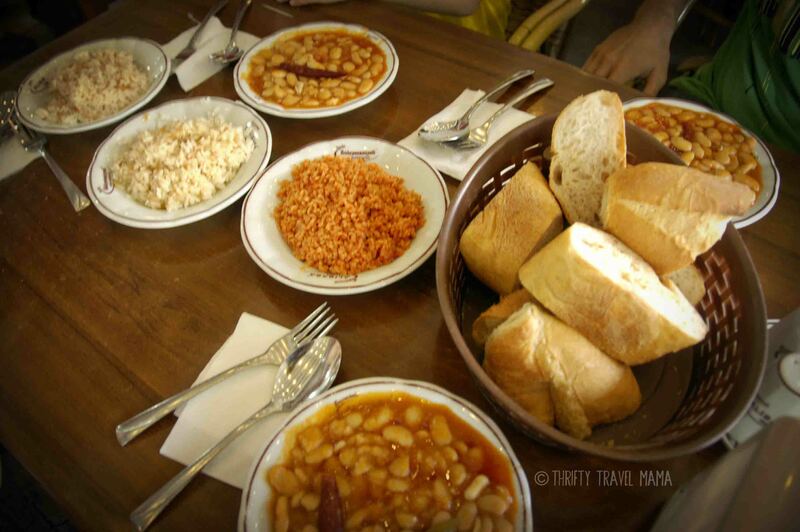 The best places to sample Kurufasulye (Turkish beans and rice) are near the Sulemaniye Mosque. We chose Ali Baba on the corner because it had stellar reviews, but other restaurants on that row serve similar dishes. The beans are cooked in a spiced tomato sauce and the rice is more of a pilaf. We also sampled the couscous which was equally as flavorful. 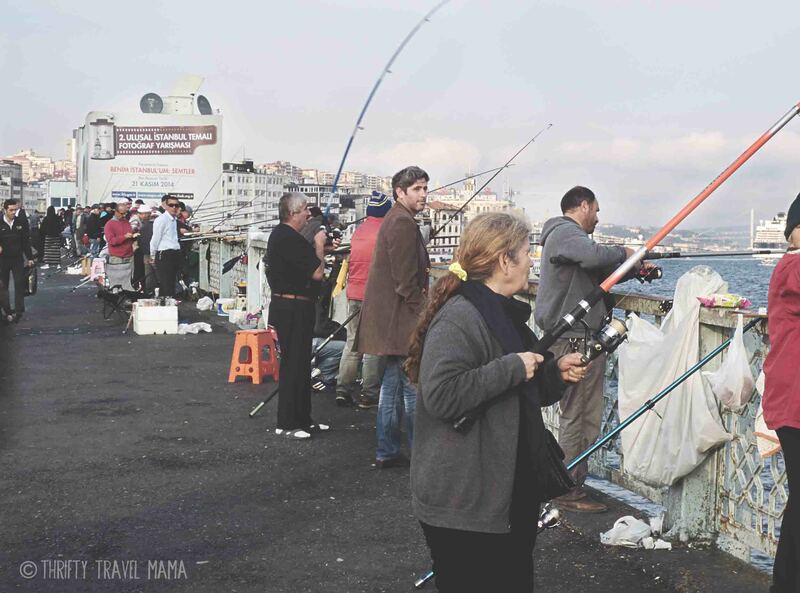 As you walk across the Galata Bridge, you’ll see scores of amateurs and professionals doing their best to snag a decent day’s catch. 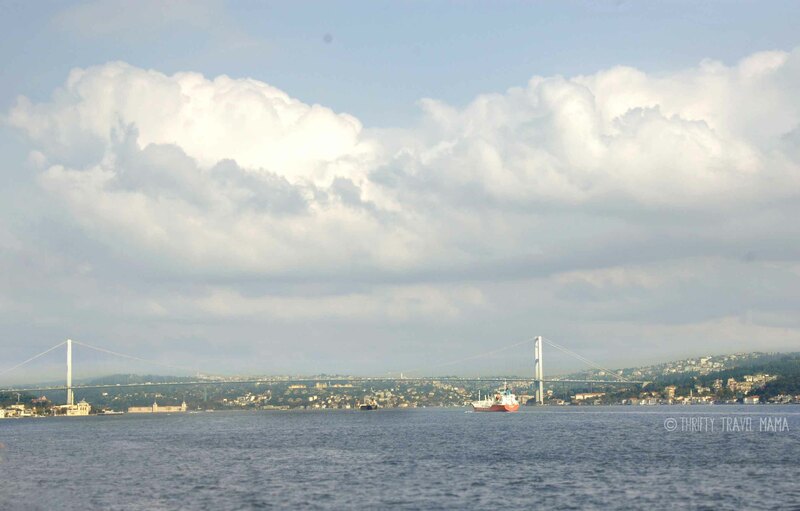 It’s true that Turkish people love meat, but with its close proximity to the sea, fish is always available in Istanbul. However, if you’re a bit on the fence about fish like I am, you can tread lightly and make a sampler dinner by ordering a fish sandwich to go from Furreyya Galata Balikcisi and supplementing with delicious falafel from Kikero Falafel across the street. 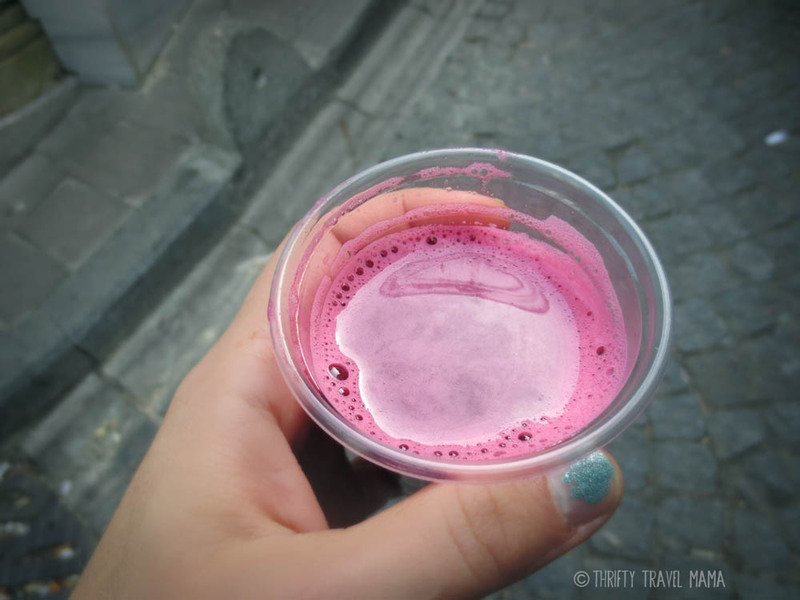 We rounded out our meal by picking up drinks at a small market and walked back down toward the Karaköy tram station. With food growing cold and tummies rumbling, we ended up making a picnic – right in the middle of the road. It was fabulous to be in the eye of the traffic hurricane while munching on moist fish and crispy falafel. You may have heard of the legendary Turkish coffee – stiff and gritty like the streets of Istanbul. Maybe grounds with your brew isn’t your thing, though, and you want something a bit more like your morning Joe at home. 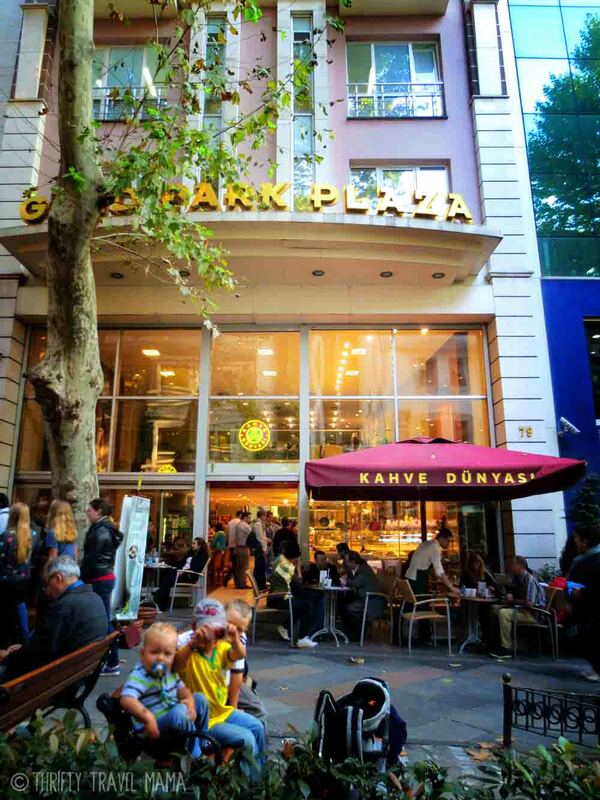 Enter Kahve Dünyası. This western-style coffee shop serves carefully crafted caffeine as well as CHOCOLATE SPOONS. Seriously. I highly recommend sharing a treat here after a long (morning/afternoon/day) of haggling at the Grand Bazaar. Typically, our diet leans heavily on the healthy side of the scale. Living in Germany forced me to make nearly everything from scratch and to appreciate simplicity of flavor and ingredients. So, it may come as a shock to you that Doc Sci and I have tried McDonalds in nearly every country we have visited. Yep, shameful but true. Despite this reality, I never set out to taste-test Turkish McDonalds. Unfortunately, once my kids saw the big M, it was all over. I find it funny that they ask for McDonalds and even consider it their favorite restaurant since I can count on one hand the times in their lives when we’ve eaten there. But, everyone has their breaking point. Four hours in the Grand Bazaar was theirs. If I wanted to bring home some lanterns, I was going to have to give up something in return. And so the if-you-don’t-whine-and-let-me-bargain-in-peace-I’ll-buy-you-gross-McDonalds-for-dinner plan was hatched. Verdict? It’s pretty nasty as far as McDonalds goes. I’ve definitely had better Big Macs. But, they loved it, and I got my lanterns and no one threw up. That’s a win in my book. Dondurmasi Ice Cream – This is one part entertainment, one part humor, one part ice cream thickened with mastic, among other things. There’s a shop with a show near the corner of Divan Yolu Cd. and Babı-Ali Cd. on the tram line. You can catch a preview of what’s in store for you here. The conniving cream peddler wasn’t at his post when we walked by, so we bought ice cream at the grocery store just north on Babı-Ali Cd. When we returned to Divan Yolu Cd., the show had begun. We ate our ice cream at a safe distance from the slick man and his stick. For more restaurants gleaned from friends and guides, you are welcome to view my Google map here. I have not personally tried everything on the map, so I can’t guarantee every spot is open and of good quality. However, I always welcome a place to begin and a fall-back list in case I run out of time to complete my own research before traveling. What’s your favorite Turkish food? 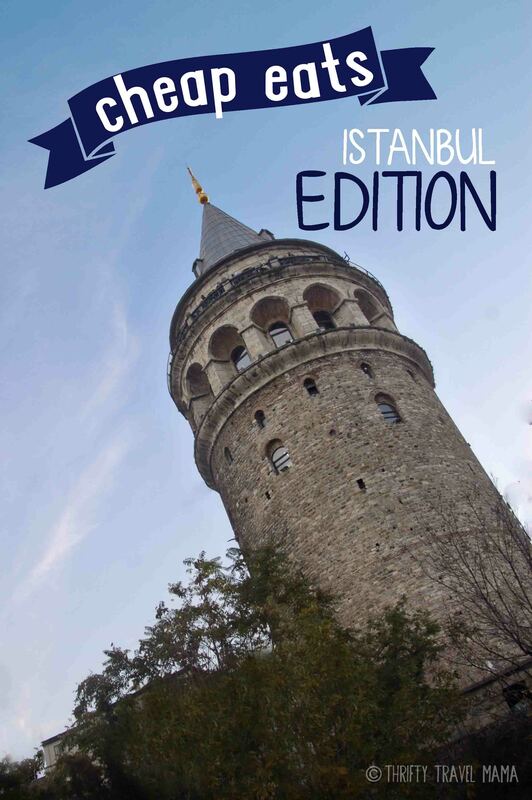 If you were in Istanbul right now, what would you most look forward to tasting? Do you have any family- and/or budget-friendly restaurant recommendations to share? There are so, so many ways to explore a city. Strolling “ordinary” neighborhoods, attempting public transportation, cooking native cuisine, people watching from a café, peering over the skyline from above with a bird’s-eye view… these are just a few of our family’s favorites. It’s rather obvious to see the sights from the ground level, and often more thrilling to take a look from on high. Please tell me I’m not the only sap for an amazing view from above? Most overlooked, however, is the belly view – experiencing a city from under the ground. 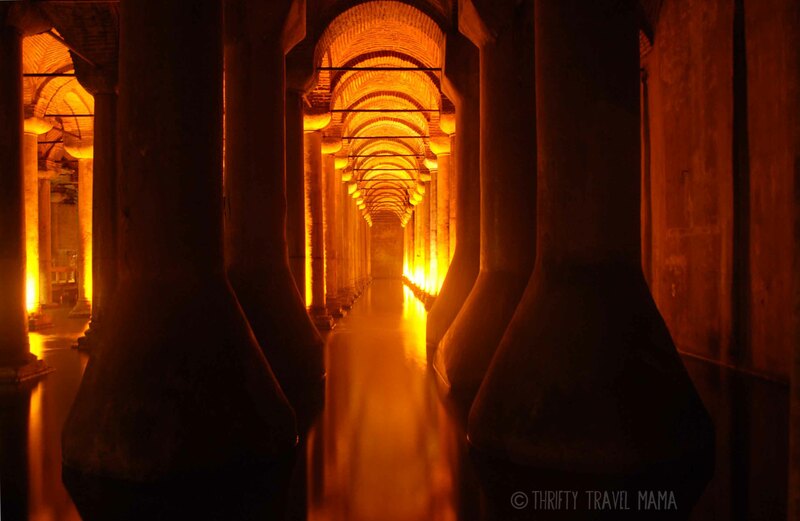 One such subterranean experience in Istanbul awaited us at the Basilica Cistern (Yerebatan Sarnici). But would it give us that unique Turkish twist we were seeking? 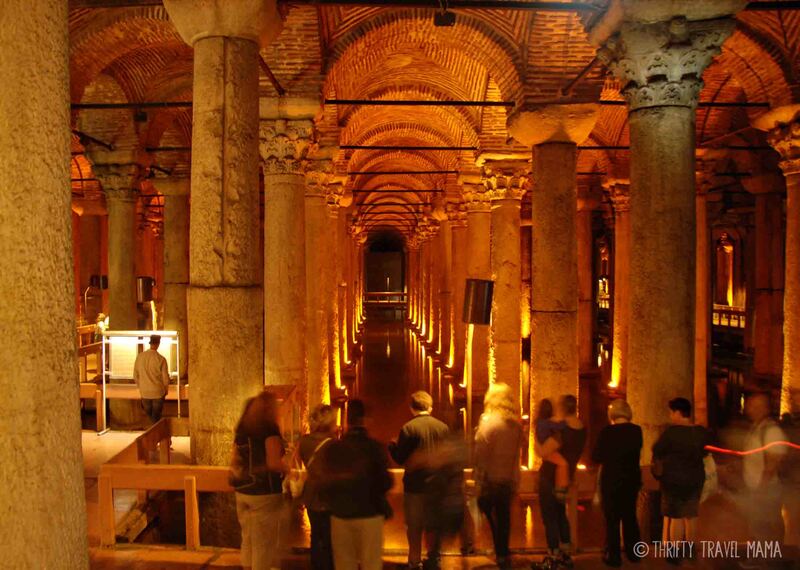 After a rollicking morning across the street at the gorgeous Hagia Sophia, we showed up at the Basilica Cistern eyes and cameras ready for more amazement. However, as we approached the entrance line, we thought there must be some mistake. 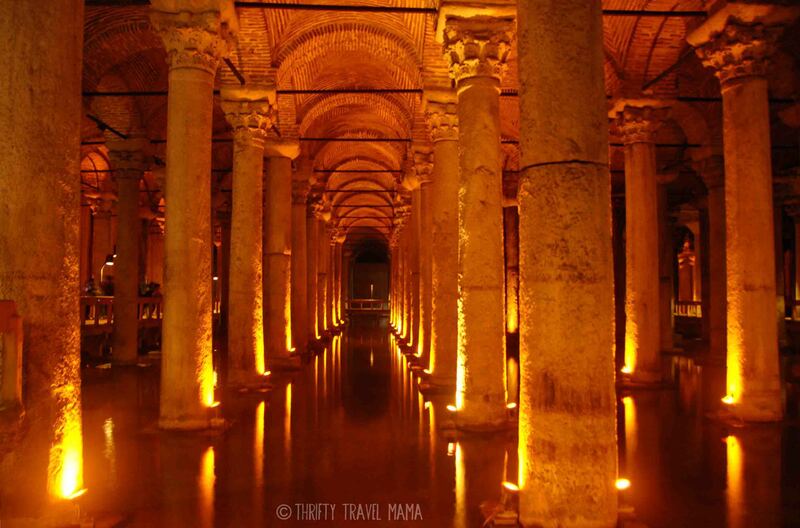 After all, most of Istanbul’s historic treasures are total eye candy. Not this building. In fact, if it weren’t for the queue of tourists, we very well could’ve been vying for a spot in a Turkish jail cell. A postage-stamp building, bars on the windows… are people really going to steal the water in the cistern or attempt to make off with a gigantic stone column? 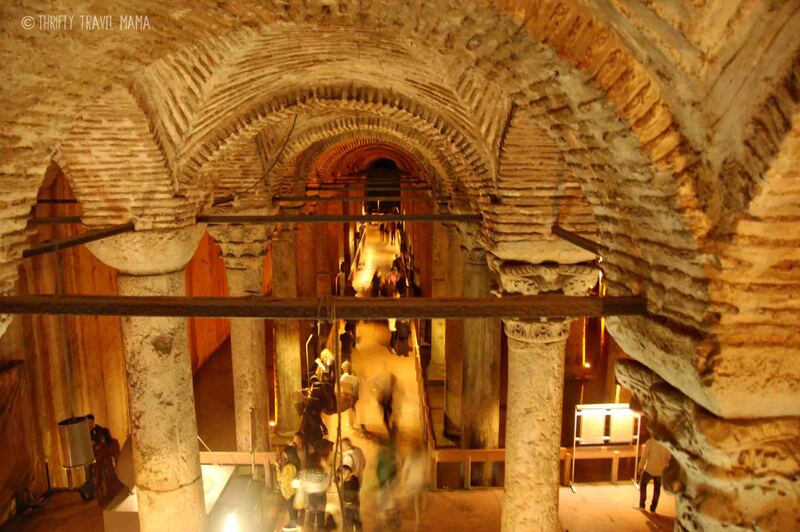 Forty Turkish liras later, we slipped down the slimy marble steps to the cistern itself, water source to emperors and sultans for over a thousand years. From the staircase landing, the 336 columns come into view. Chipped but sturdy, these pillars remind all who enter just how surprisingly solid ancient structures can be. Now on the platform level, we began to wander down the corridors of dramatically lit columns, and I begin to wonder… If it weren’t for the theatrical lighting, would this place have much to rave about? Around the prescribed path we walked, trying to envision James Bond hightailing it past us in To Russia With Love. That would certainly up the thrill factor, because right about now, I’m thinking I just paid nearly 15 bucks to stroll around a big room on a platform with nothing but a thin layer of murky water covering the floor. But, wait, you say. What about the mysterious medusa heads? Ah, yes, the snake-headed sisters sitting at the base of a couple of columns on the northeast side. Such a thing is surely worth a look. So, look we did… along with every other cruise-ship-sailing day-tripper. Hence the blurry photo. It’s no use denying that the bases with faces are a curious thing. 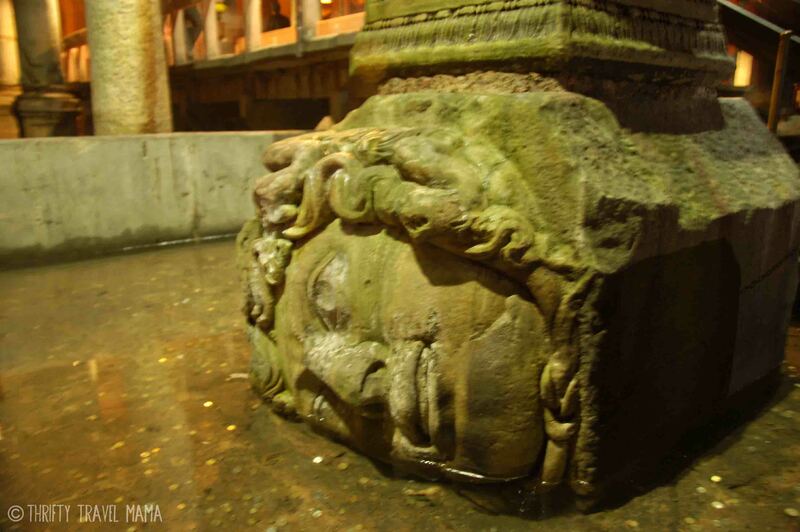 Why would one erect a column atop an inverted or rotated Medusa head? Would the images ward off those who sought to poison the waters? Or were the heads inverted to stunt the power of the Medusa? Or might they be borrowed from an earlier structure as part of an ancient recycling program? The solution to Medusa’s mystery is anyone’s guess. But, here’s a mystery I’ll just go ahead and solve for you right now. There’s really nothing special about the Medusas that can’t be seen in photos on the Internet. In fact, those photos will probably be better than anything you or I could attempt, given the frenzy over the heads that makes it nearly impossible to get a clear shot. At this point, we had walked up and down every bit of bored-walk. No matter where we rested our eyes, we could only see two things: people and blazing stone columns. Is this it? Well, yes – yes, it is. In an effort not to let those forty Turkish liras go completely to waste, I decided to have a bit of fun with my camera. Taking photos in the dark isn’t something I do often, so it’s a challenge to snap a decent shot without a flash. Painting the darkness on my camera screen with flaming streaks of orange light provided a brief reprieve from pillar monotony. Well, that is, until I realized my boys were also bored and making a break for the three-inch pool beneath the boardwalk. Now off the precarious elevated path, I took one more quick look around as a last-ditch effort. Surely, there has to be something else of interest down here…? There, in the corner! The shiny costumes flickered at me from afar. Sumptuous fabrics and fanciful headpieces adorned a couple intent on returning home with evidence that they had, in fact, lived like a sultan and queen while in Istanbul. You’d think I’d scoff at such silliness, but actually, a part of me wanted to give the absurdity a try. 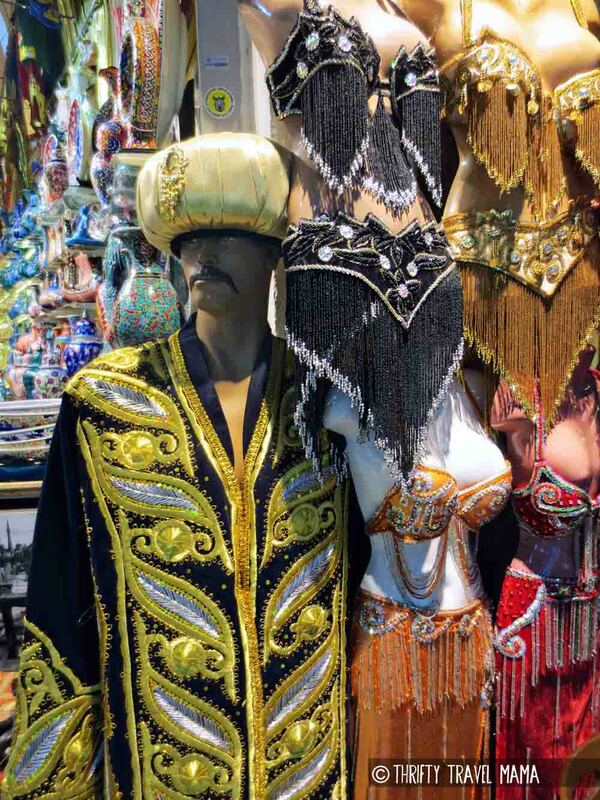 Anyone can shimmy into a pair of chaps or wiggle into a saloon girl dress in America, but Turkish royalty costumes are a bit harder to come by. Unfortunately for me, Doc Sci wasn’t at all interested in foolishly gallivanting as Ottoman royalty. Such a shame, since masquerading as Korean royalty in Seoul was his idea. 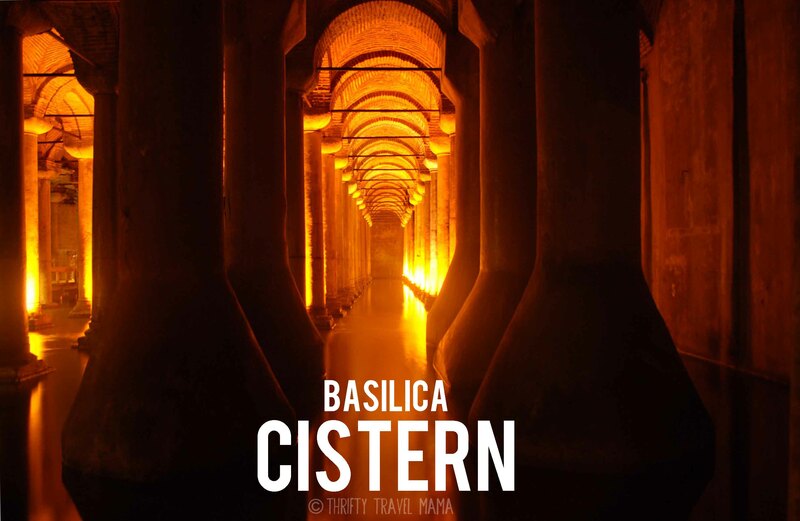 Unless you’re doing your best to beat the Turkish summer heat, the Basilica Cistern isn’t worth a slice of your Istanbul travel budget. Your time and effort would be better spent scrolling through photos online or even taking a virtual tour, available from the Yerebatan Sarnici website itself. My advice? Buy a postcard, and spend your 20TL per person elsewhere. What featured attraction(s) have you been to that didn’t live up to their hype or seemed like a waste of time and/or money? Have you ever given much thought to how your neighbors look or compared the similarities and differences in culture and custom? In the US, I never thought much about the families in the next house or car or Target aisle because, well, they all pretty much looked like me. My neighbors in Germany, though, reflected many beautiful people groups from around the world. I regularly shared the elevator with women in saris, hajibs, African headwraps, dirndls, and wool hippie clothing. Unfortunately, other than a handful that spoke English, I couldn’t ask them about their culture or customs. While I wished I had both more vocab and courage, I was mostly content to admire this sampling of international style. It’s true that many areas of America host a mosaic of nations. But in order to really get a feel for a particular people group, you need to set foot on their soil and soak up their native atmosphere. Germany is home to loads of Turkish people, but they have to adapt their way of life to the dominant German one. Experiencing Turkish culture in their homeland was one of our greatest privileges during our time in Istanbul. Seeing as this was our family’s first visit to a Muslim country, it’s only natural that little boy brains were filled with questions. What is that strange sound broadcast several times per day? Why do the women dress this way? Why are those people on their knees, touching their heads to the floor? I relished these dialogues and hope for many more of the same on our subsequent trips to Muslim nations. I hate that fear in America has created stereotypes; not every Muslim is a terrorist as certain media outlets would have us believe. I don’t have to agree with everything one believes in order to show compassion and care. We must love people because they are people – daughters, sons, mothers, fathers, brothers, sisters – that, on a basic human level, are just like us. One of the best ways to understand this is to observe and interact with people different from ourselves in their home environment. So when my boys imitated the call to prayer, we explained the importance of these sounds to the people of Istanbul. We taught them to respect rather than mock. When my boys asked why I had to wrap a scarf around my head inside a mosque, I pointed out that all the other women in the mosque covered their heads, and as guests in this land, we must respect local customs. 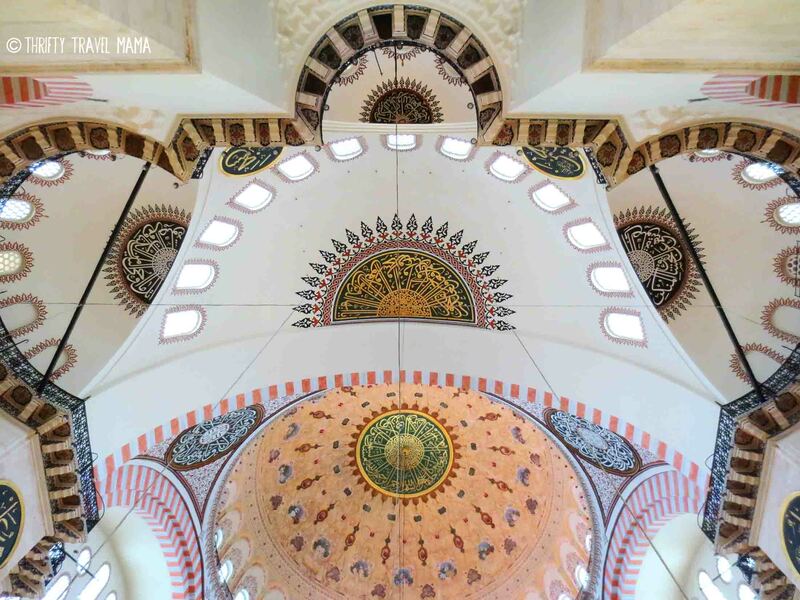 All those conversations (and likely the fact that they could sit on the comfortable, carpeted floors) pushed the intricately decorated mosques up to “favorite” status with everyone in the family. When you visit your local place of worship, do you wait in line? Probably not, but it’s also likely not as famous as the Sultan Ahmet Mosque, aka the Blue Mosque or Sultan Ahmet Camii. On the day of our visit, we slowly snaked past a hut loaning out cover-ups and headscarves for female guests until we reached the actual entrance. We bagged our shoes as requested; this helps the plush carpets inside to remain clean. I then blanketed my head with a gauzy scarf and stepped inside. 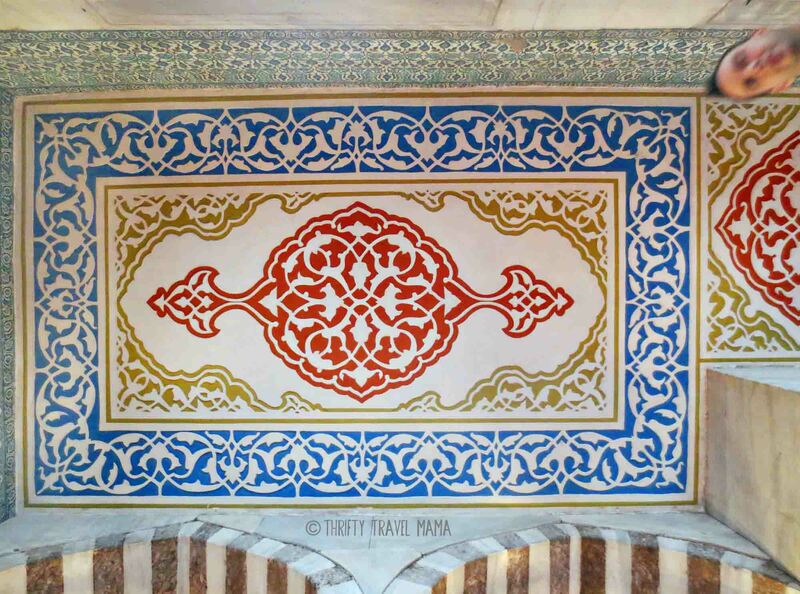 You don’t need to be an interior designer or artist to appreciate the graceful patterns adorning mosque interiors. 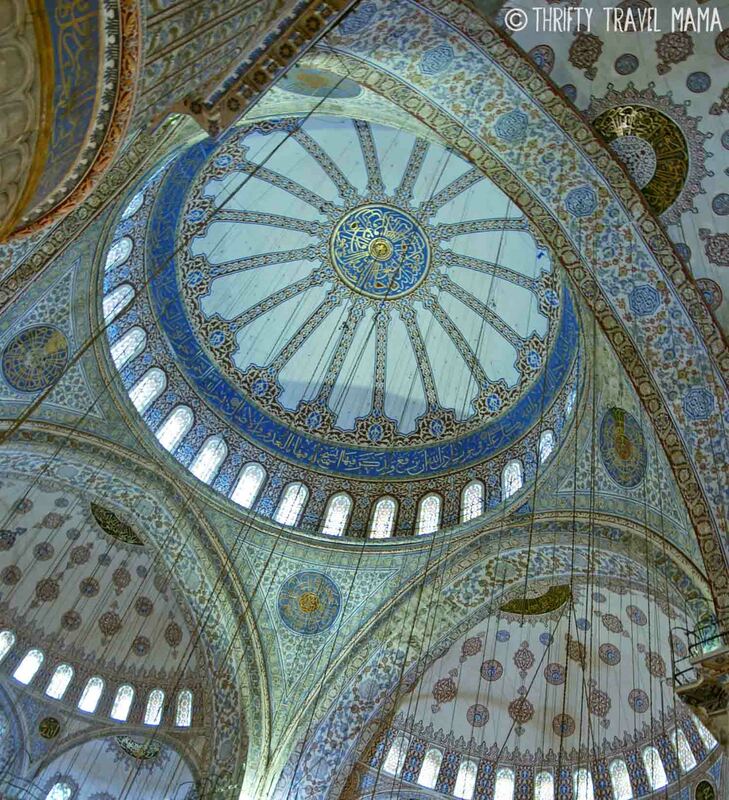 The Blue Mosque, as the name suggests, is particularly famous for its woven lines in a dominantly blue color scheme. 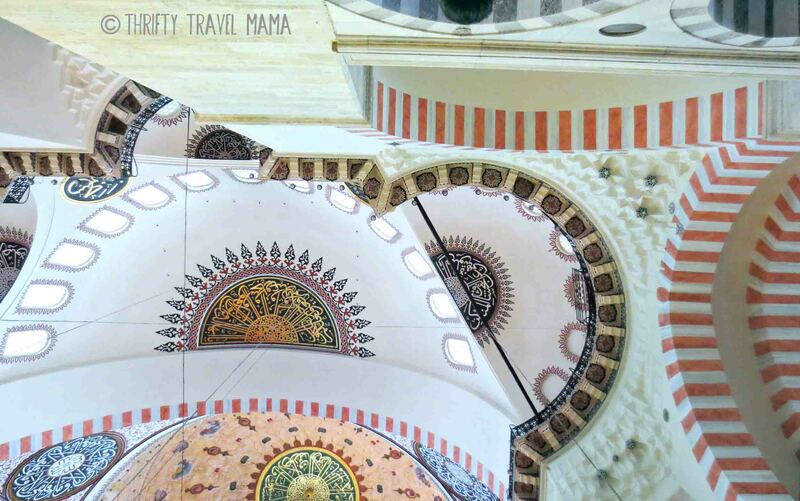 Tip your head up to appreciate the fullness of the decorated ceiling, but be careful not to fall over backwards in awe or bump into another visitor. Delight your eyes with blue, gold, and persimmon dancing in harmony over every inch of wall and ceiling. Entrance to the Blue Mosque is free. However, the mosque is closed during prayer times. Be sure to check the current times here. If you are not Muslim, you will only be permitted to visit a small part of the building. However, even the third or so of the main floor is worth your time. Women, tuck a scarf and cardigan in your day pack, and be sure to wear a long skirt or pants. If you forget or don’t have these items with you, garments are available to loan just before the entrance. 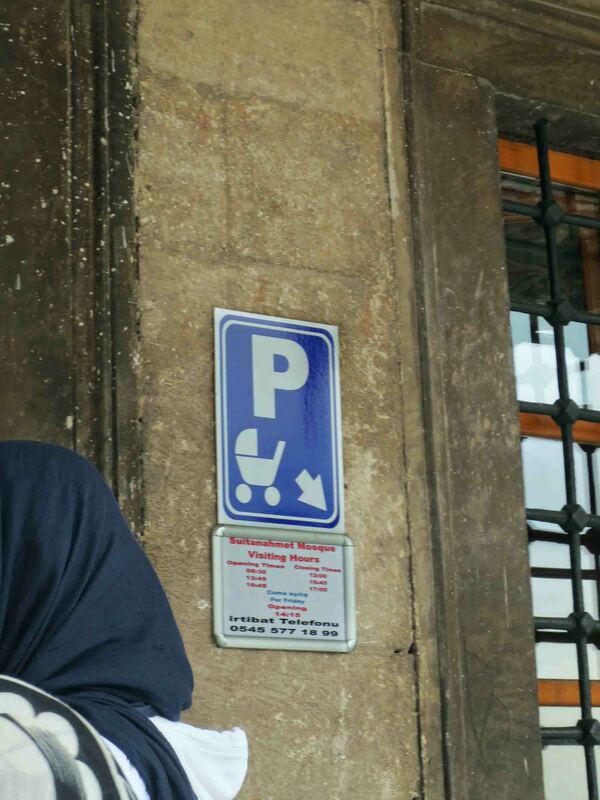 If you’re bringing a child in a pram, know that you’ll need to park it outside the mosque. We didn’t bring one, so I can’t say for certain how that works. However, I did see the stroller parking sign at the top of some stairs, so I highly recommend a folding stroller or a baby carrier instead. When the weather in Istanbul broils, dip into a mosque. The carpets are cool and the atmosphere calm. 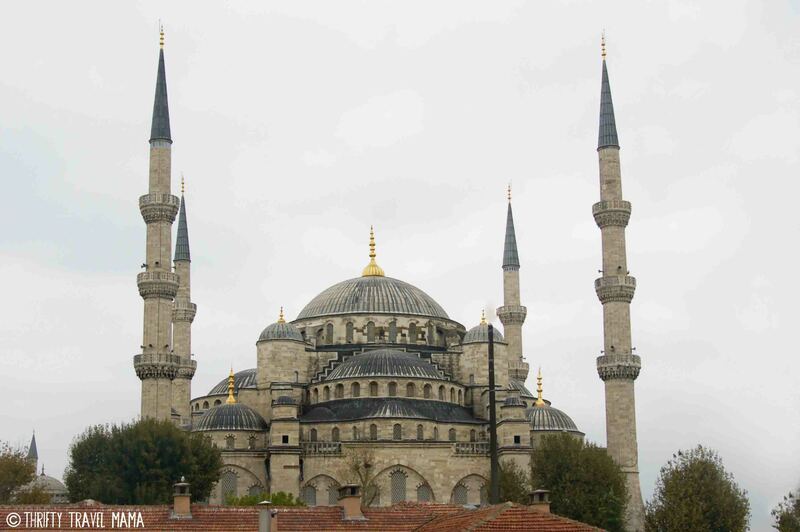 Less famous than the Blue Mosque, Sülemaniye Mosque crowns one of Istanbul’s seven famed hills. Practically speaking, this means two things: (1) the view is amazing but (2) the climb to get there is a royal pain. 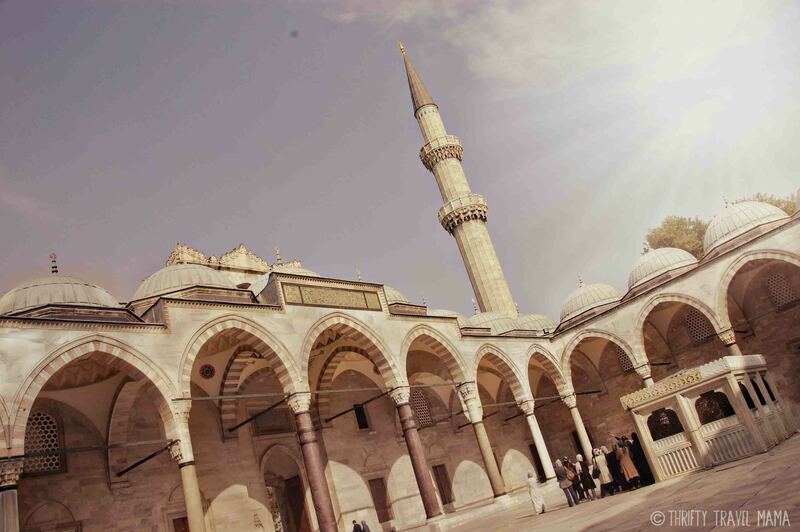 The largest in Istanbul, Sülemaniye Mosque was constructed in the 16th century at the order of Sultan Süleman. History nerds, you can read more about the mosque’s construction here. 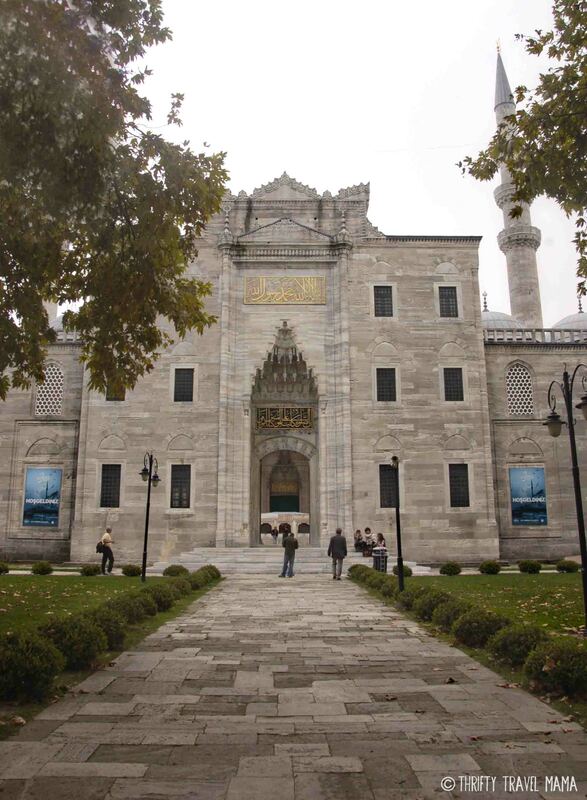 I must admit, Sülemaniye ended up stealing the #1 mosque spot from its indigo sister. 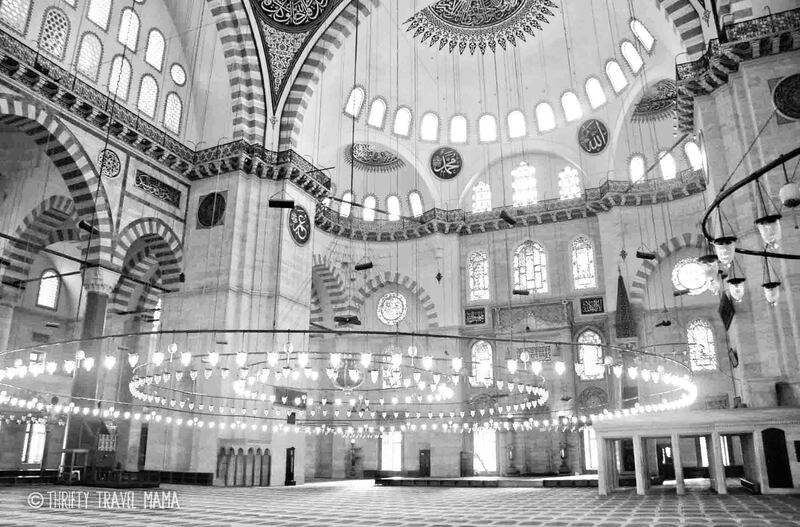 Fewer visitors, no line, and a clean white interior – the Blue Mosque just couldn’t top that. After a serious hike up the hill to reach the mosque, we paused for a moment to enjoy the amazing view from Sülemaniye’s garden. 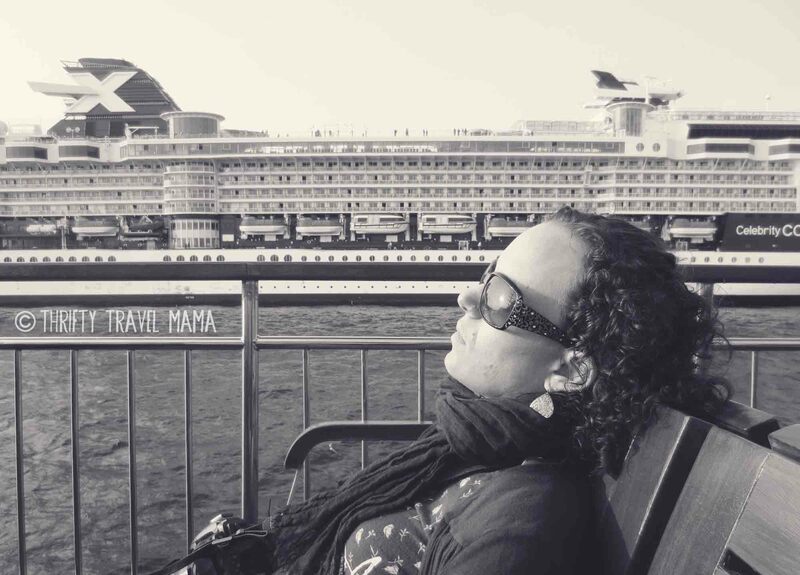 From there, we could see Galata Tower and Bridge and even the ships beyond. 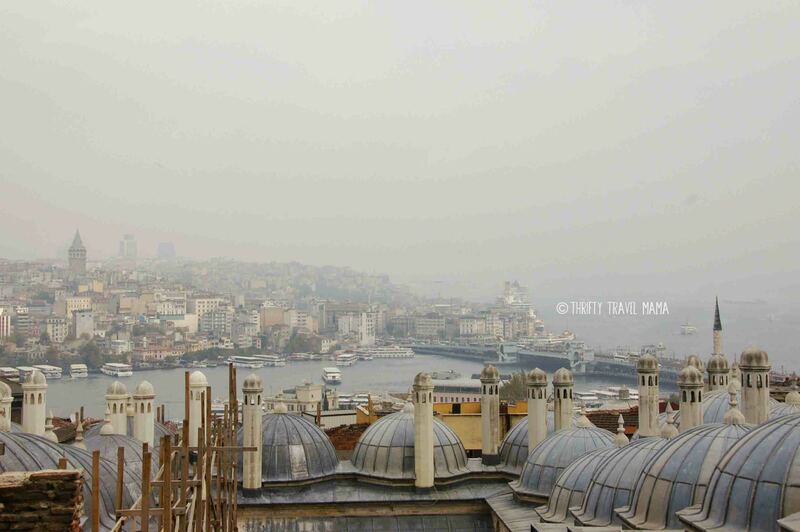 As is common in Istanbul, haze caused low visibility and construction props obstructed part of the view. But still – you do not want to miss this panorama, especially since it’s completely free! Sülemaniye’s courtyard delights at first look with stone latticework, arches, and colonnaded peristyle. While there, I noticed that we were sharing the space with other Muslim tour groups instead of foreign cruise ship/tour bus groups. I learned while staying at our hotel that many Muslim couples choose Istanbul as a honeymoon destination. Fascinating! Sans shoes, inside we rested on the carpet, recovering from the strenuous climb up the crooked streets of the hill. The boys explored the interior on hands and knees, and they assured me that the carpets are as comfortable as they are beautiful. The interior of Sülemaniye is calmer on the eye than the Blue Mosque. 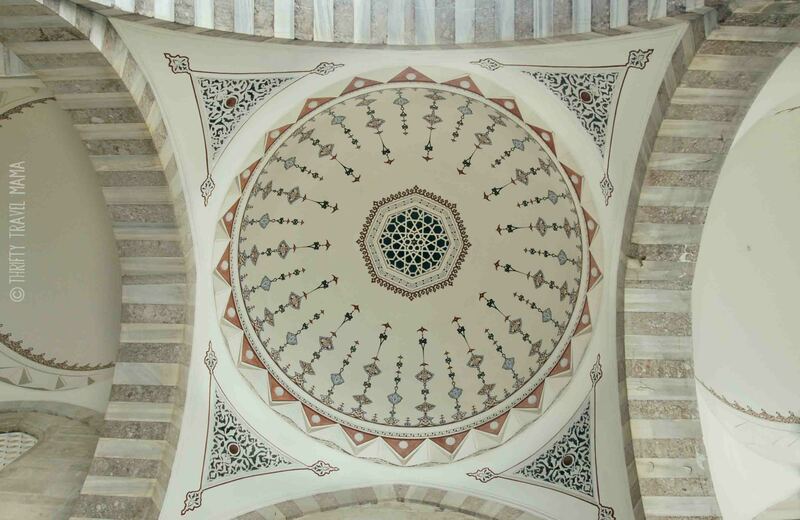 Of course, it’s not devoid of the delicate designs that are typical of the Islamic style. A broader color palette – pink, cinnamon, hunter, navy – is sparingly crowned with shimmering gold script. Other areas of the walls and ceiling offer a more subdued pattern, cleaner but elegant in its simplicity. When the eyes have had their fill, the stomach often wants its turn. And boys only act like gentlemen for so long before they go the way of the wild. They’d behaved so well, so quiet and respectful inside, we determined to end on a good note. So long lovely mosque. Hello, lunch! 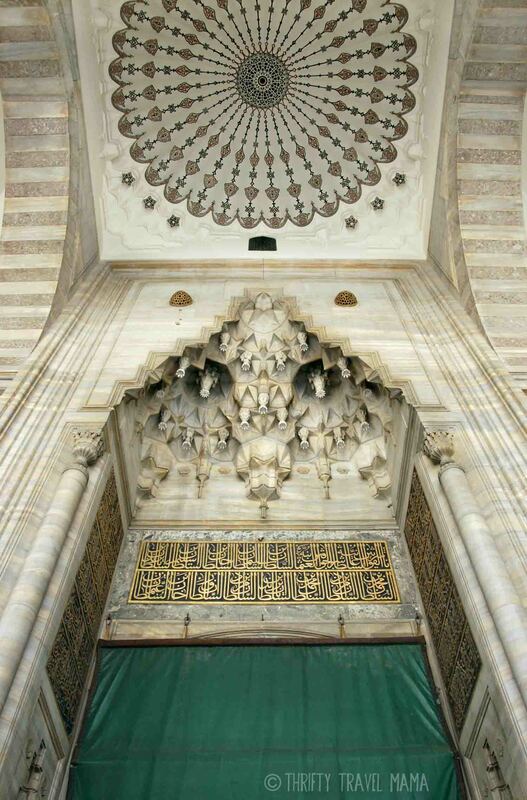 Entrance to the Sülemaniye mosque is also free and closed during prayer times as mentioned above. To see a general guide to prayer times, click here. Tips regarding attire apply to all mosques. 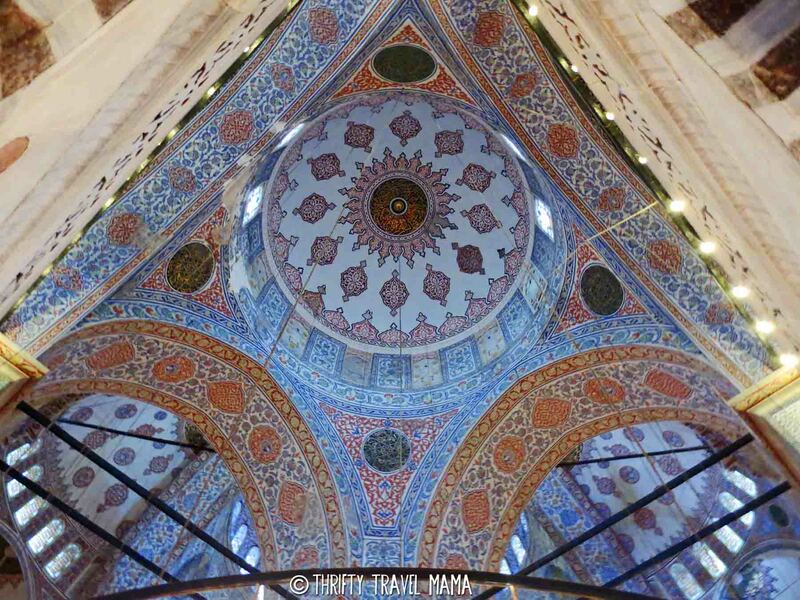 Not all mosques have loaner garments, but like the Blue Mosque, Sülemaniye does. 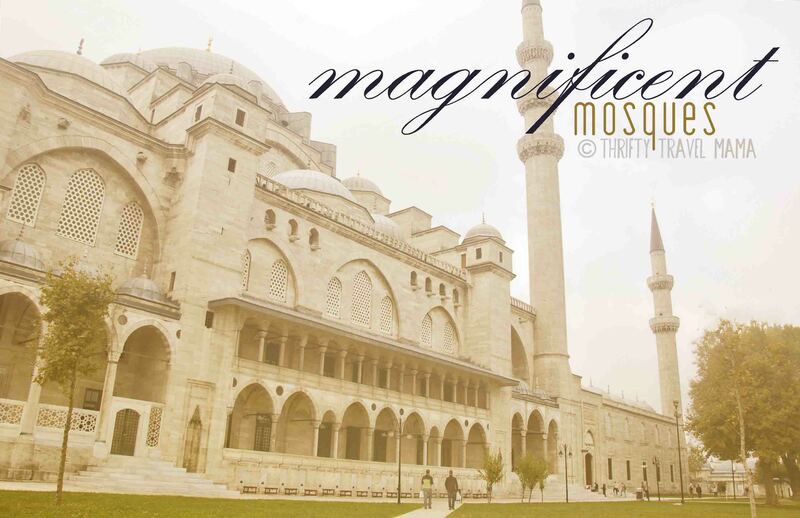 Don’t forget to explore the mosque grounds. 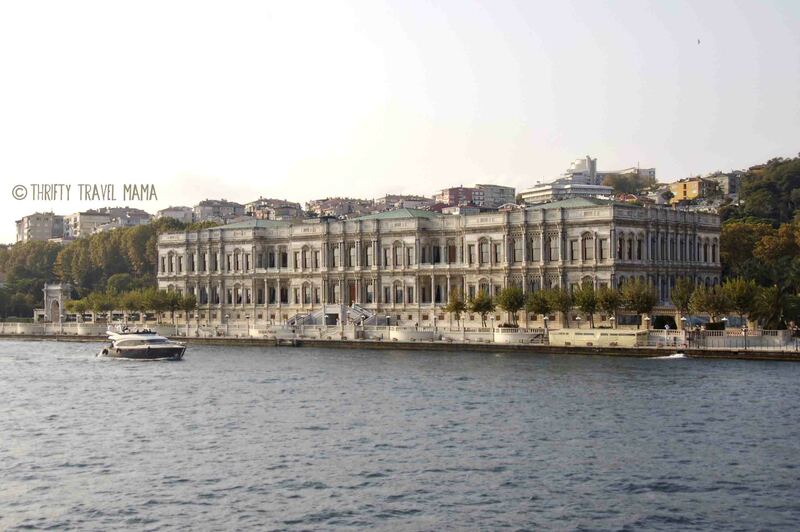 They’re more extensive than the Blue Mosque and provide panoramic views of Istanbul. I noticed a pleasant tea garden right outside the mosque walls, but since we were all hungry for lunch, we did not get a chance to try it. The bathrooms in the courtyard of Sülemaniye were abysmal and overpriced when we visited. When you gotta go, you gotta go – but just know that you’ve been warned. 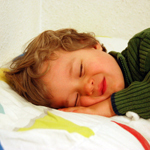 Talk with your kids about appropriate (quiet, calm) behavior. The Blue Mosque is much noisier due to its heavier traffic; Sülemaniye is much quieter so rambunctious rascals will surely stick out! For more general do’s and don’ts for mosque visitors, click here. 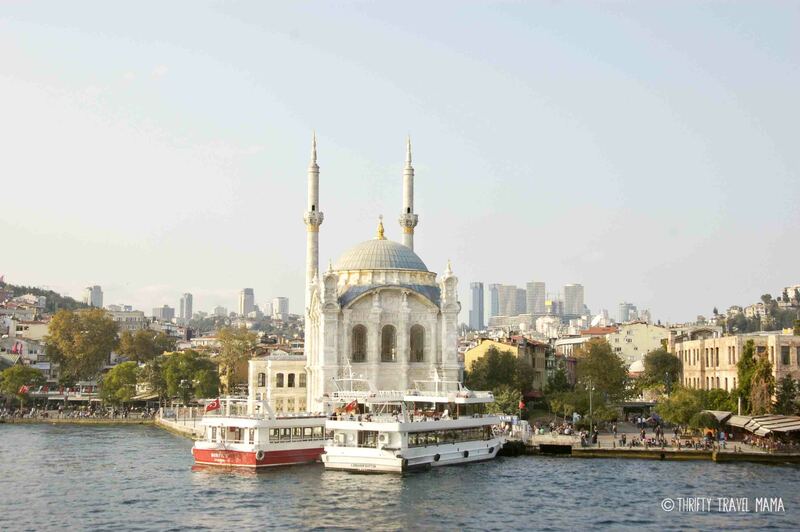 Have you been to either the Blue Mosque or Sülemaniye Mosque? If not, which one is more your style? 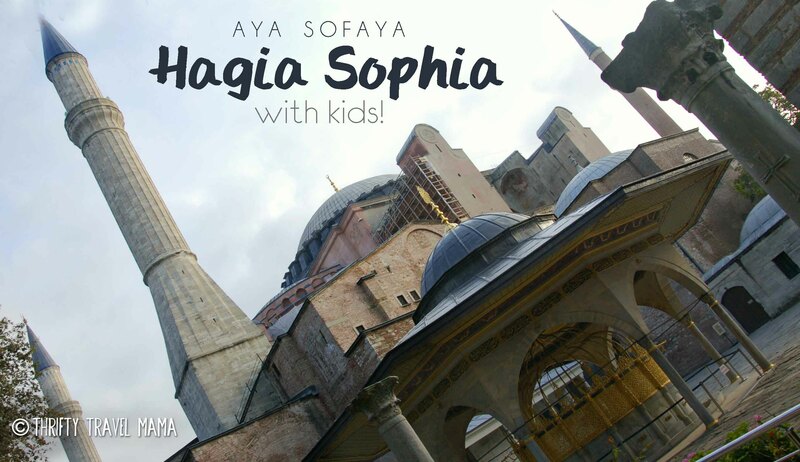 Only a handful of places in the world really live up to their travel hype, and the Hagia Sophia is one of them. 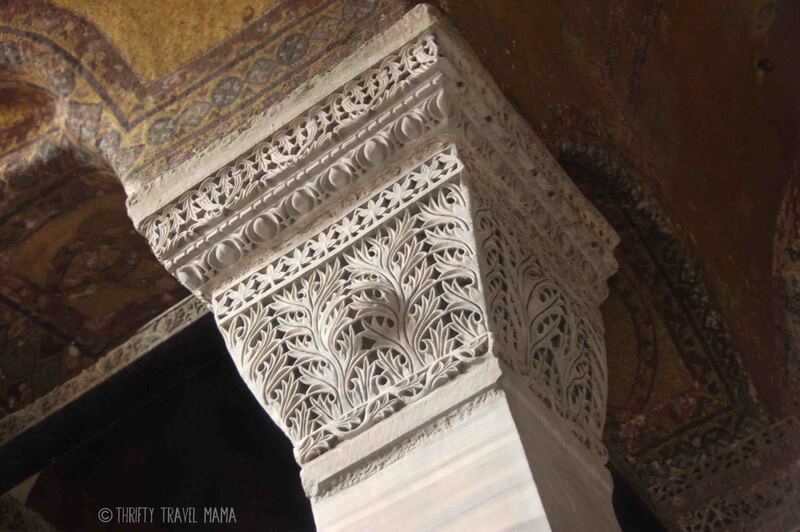 You guys – the Hagia Sophia is one of the most phenomenal places I have ever been! Since my final teenage year as an art history university student, I have wanted to see the Aya Sofya with my own two eyeballs. Coffee table photo books just.do.not. do it justice. 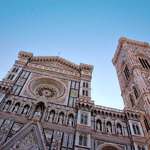 From church to mosque to museum, this masterpiece has seen a lot of history since she was completed in the sixth century. Gorgeous, amazing, and gigantic – you do not want to miss this! Unfortunately, the rest of the world feels the same way, and they’ll be accompanying you on your visit. We arrived as early as humanly possible with 3 kids and no threat of fire. We still waited in line for a bit and had to endure the constant hawking of tour guides touting their services to the queue. Thankfully, we did beat the cruise ship / tour bus crowd, but only by about 30 minutes. With the exorbitant (for Turkey) admission fee paid, we made our way to the entrance. I stopped my boys in front of the doors and snapped a photo of them. The three amigos have no idea what the Hagia Sophia is, but some day I can show them the photo as proof – both that they did visit and how small they were compared to the towering doors. Once inside, we decided to go up first since most of the crowds stay down on the main level. After peeking down on the hordes and up at the marvelous ceilings from the mezzanine, I went searching for a few ancient pieces heretofore only seen in textbooks. I found the famous glittering mosaics hidden away in on the far side and, sadly, falling apart. I had hoped for more mosaics (love them! ), but much of the interior is painted, not tiled. I loved that I was privileged to see them; I hate these tiled masterpieces only left me wanting more. Downstairs, the main area was completely filled with tour groups. Making elbow space to take a photo proved challenging, as was taking pictures sans tourist heads or arms. We didn’t rent an audio guide, but I imagine it was difficult to get near some of the featured points of interest because of the crowds. 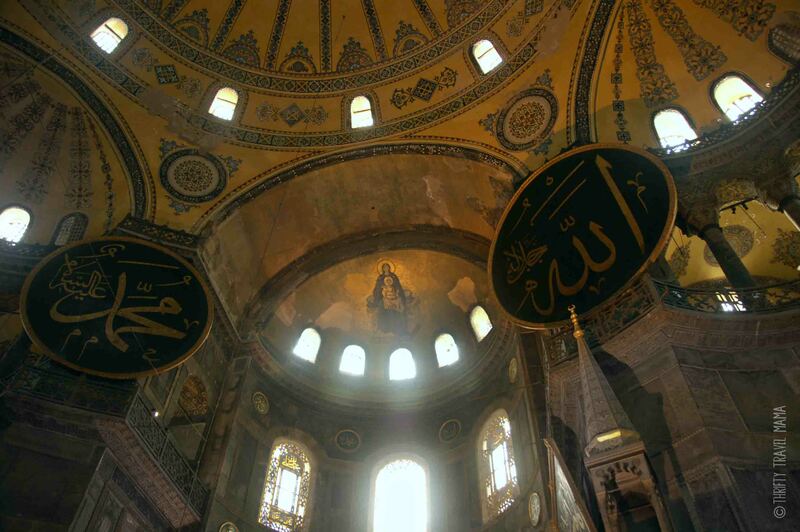 Though the Aya Sofya is no longer a mosque, the interior is heavily decorated with Islamic motifs. 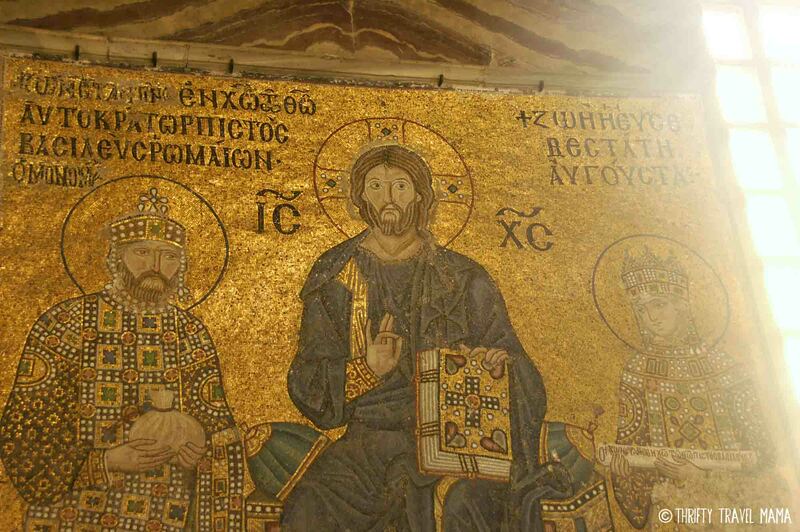 These are sprinkled in among the early Christian art. I found it to be an intriguing mix, but you’ll have to draw your own conclusions concerning the design. 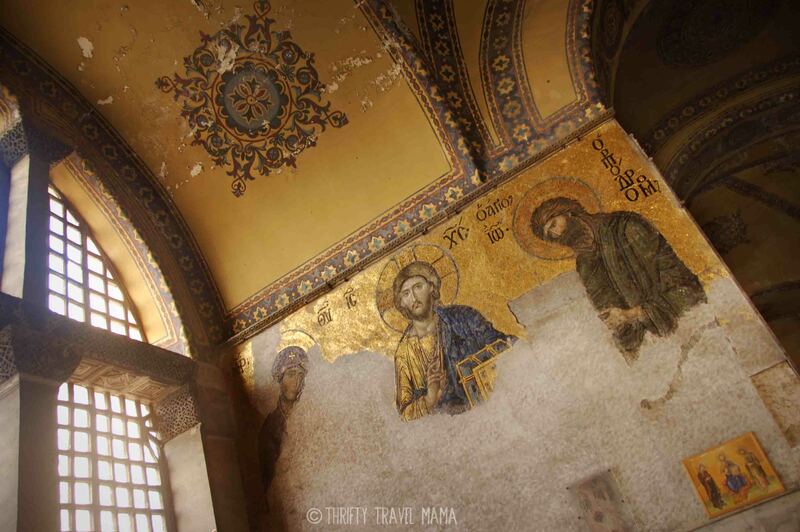 Was visiting the Hagia Sophia worth it? This is not even a question worth answering.. You cannot visit Istanbul and not experience the Hagia Sophia. It’s a crime against art. 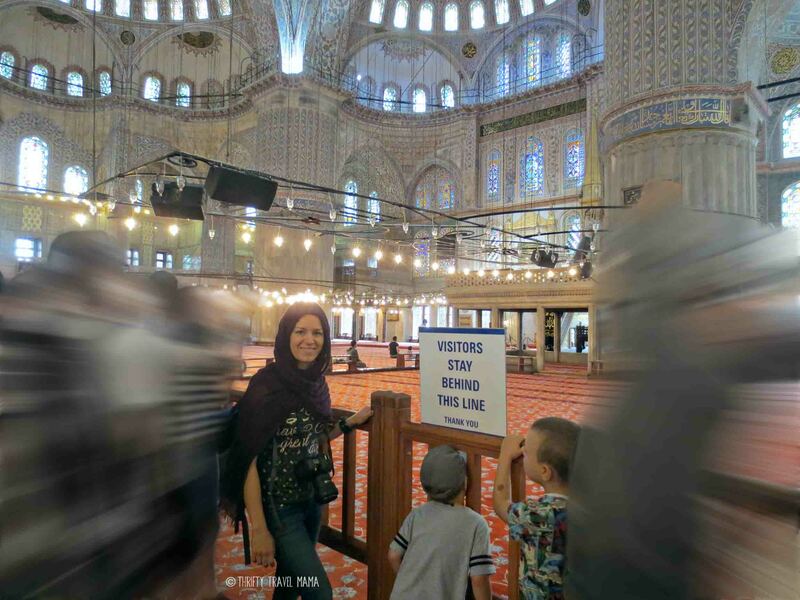 The “8th wonder of the world” truly is an architectural, historical, artistic, and cultural gem that should top every family’s Turkish bucket list and one deserving of the price of admission. I feel like I should say more, but I really can’t do the place justice. You’ll just have to see it for yourself! Go early! Arrive before opening time, if possible. It may have been a fluke, but we did notice that the entrance line tapered off around 2pm. Perhaps the tour groups are all finished for the day by that time. It’s worth asking around to find the best time to go on a particular day. We spent about an hour inside. I would have liked to stay longer, but the crowds weren’t going away and my kids weren’t magically going to turn into art history buffs (sad, but true). Plus, we wanted to end the visit on a meltdown-free note. 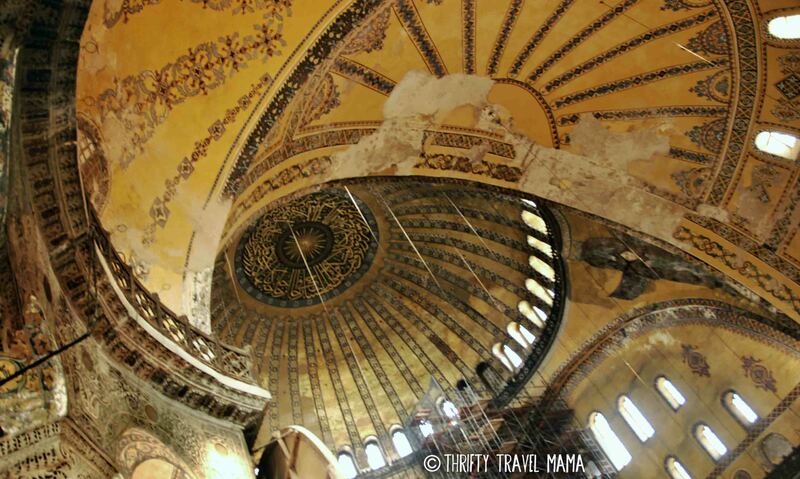 I recommend researching the treasures of the Aya Sofya in advance so you know what you absolutely want to see. Getting to the second floor with a pram would be problematic. Use a baby carrier, or plan to take turns exploring the upper level. You can rent an audio guide, but the masses may make it difficult to get near some of the featured points of interest. Use the free WC before you exit the grounds. Bathrooms are hard to find in Istanbul! The courtyard has a small café where you can make a pit stop before moving on to your next adventure. 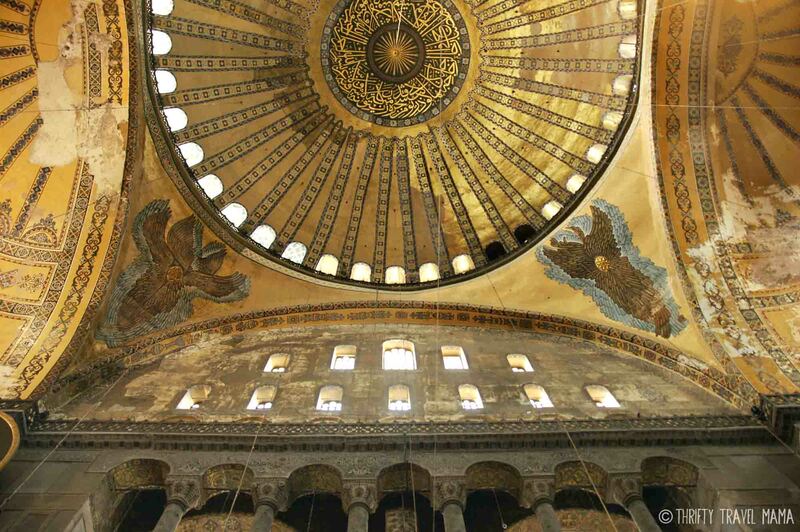 Have you ever wanted to visit the Hagia Sophia or another famous historical place? Do you think places such as this are worth visiting despite the crowds? 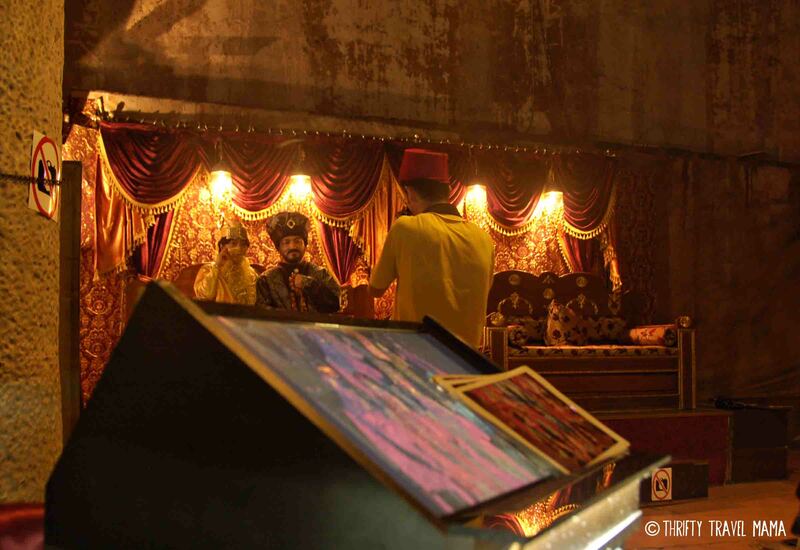 Are y’all ready to check out the sultan’s sweet digs, savory street food, and a super cheap sea cruise? 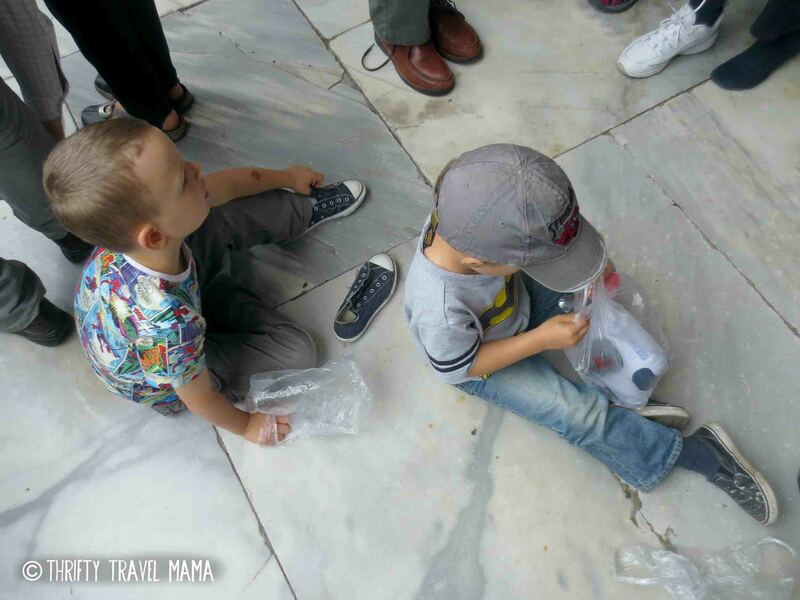 My family-friendly Istanbul recap is finally here! 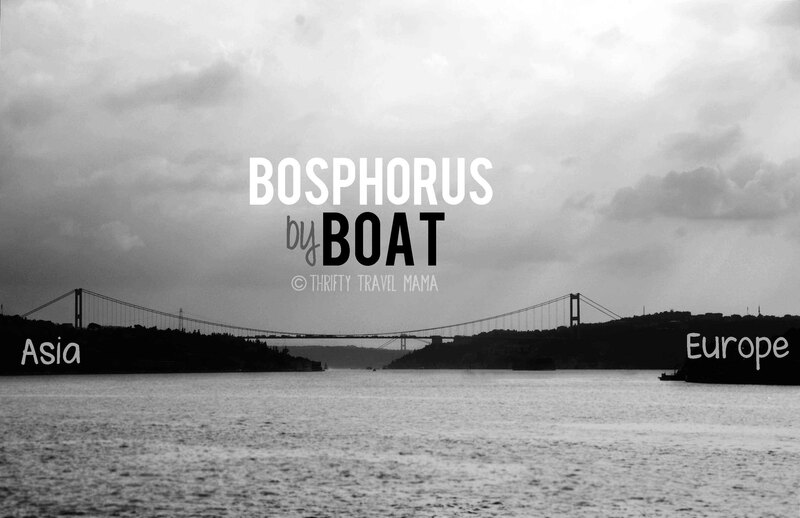 An effort nearly a year in the making, sharing our family’s Turkish adventure with you is obviously long overdue. In between spelling tests and science experiments, I’ve been editing photos and typing up posts in my rare spare minutes over the past few months. We enjoyed such a marvelous last major travel fling in the Middle East before moving to America, a trek complete with marvels and mishaps, that I couldn’t keep it all to myself. After a trip like this, the first thing I want to do is capture the essence of the adventure in words and pictures (which, unfortunately takes for-stinkin’-ever these days). Following that, I wish to share what we experienced and learned with you and all my fellow traveling families. I personally rely on these kinds of recap and bucket list posts from other travelers and especially family travel bloggers. So, without further ado, here are the treats awaiting you in the next few weeks. Links will be added to the list below as posts are published. 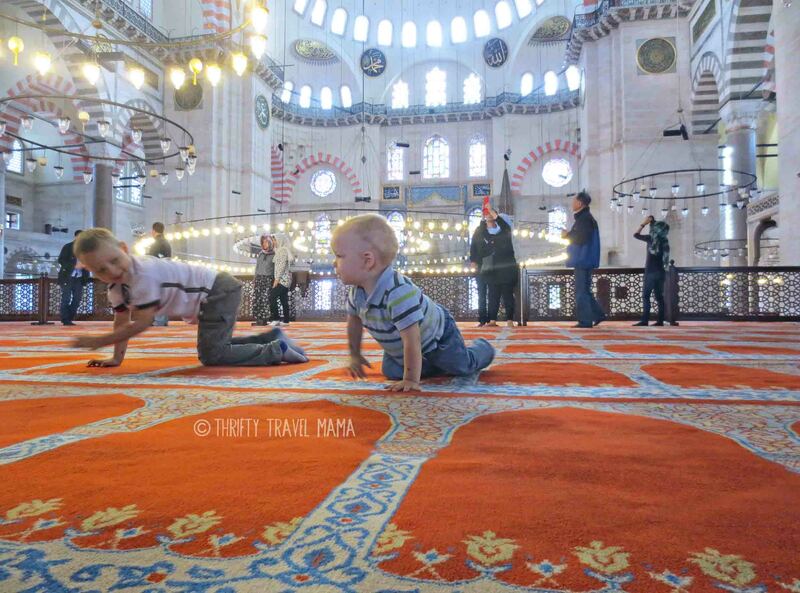 As always, I’ll discuss my thoughts on whether I found Istanbul to be kid-friendly or not. 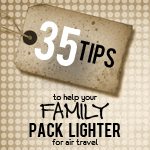 I’ll be handing over my best tips for taking your family to Turkey including valuable advice on what to know and prepare before you even leave home. I also have a harrowing hotel tale to share in hopes that you’ll avoid any potential arguments with your own accommodation arrangements. 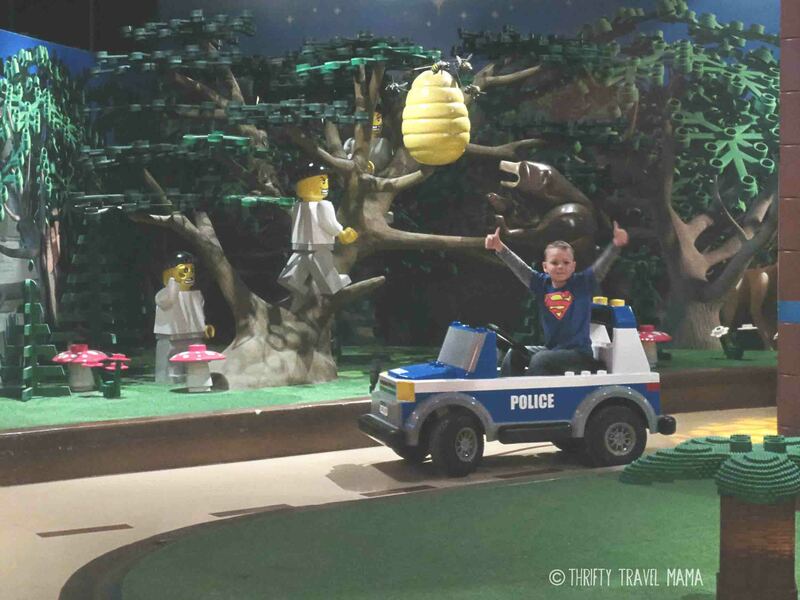 Plus, I’ve got a review of our experience flying Turkish Airlines with kids in the works. It’s both thrilling and slightly depressing to be reliving our Turkish adventure here in words and pictures. Thrilling because, hello, we went to Turkey with our kids and had a blast. Depressing because of the whole being regular Americans now with real jobs and commitments who can’t travel whenever they feel like it (whine, whine). But, whatever. Down with the reverse culture shock dumps, I say! Every day, this new life gets a bit more bearable. Meeting fellow expats helps. Making new expat friends helps. Using my passport again REALLY helps. And, writing here helps. It reminds me that we traveled before, and we can travel again. 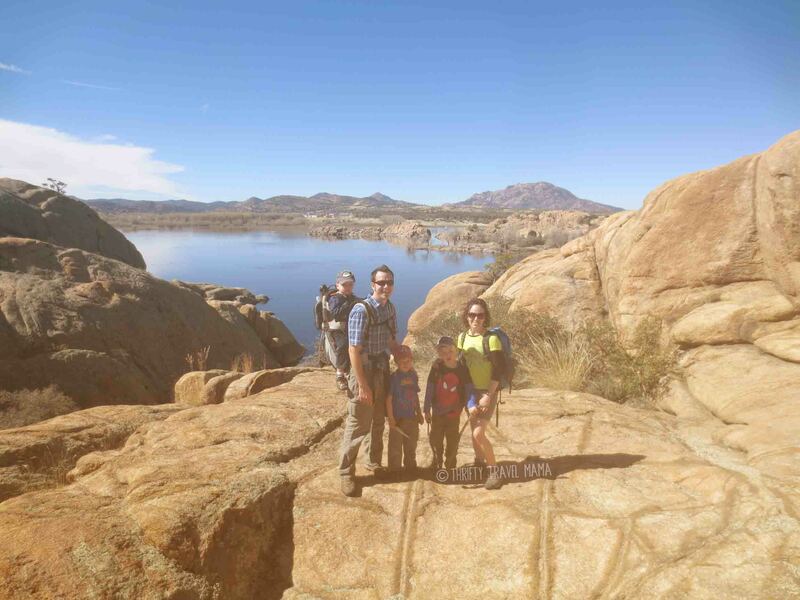 It may not look the same as it used to, but travel is different for every adventure-seeking family. See you back here in a few days when we explore the 8th wonder of the world! 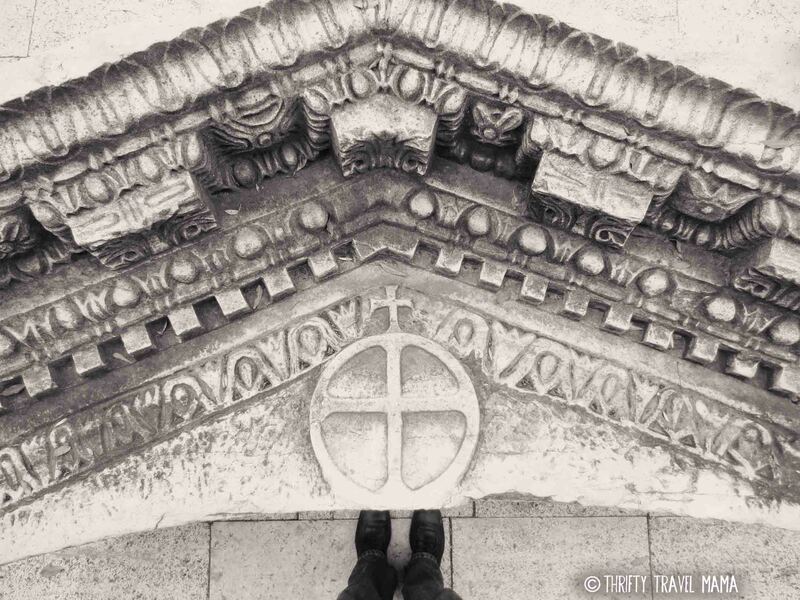 In the meantime, if you have a hankering to browse other bucket lists, you can find our Tuscan one here and our Croatian one here. Which part of the bucket list are you most looking forward to? If you’ve been to Turkey and have a story or link to share from somewhere not on our bucket list, would you share it in the comments below? This is one of my insanely long posts. Instead of just passing it off as tl;dr, make yourself a cuppa and stay a while… or just skim the headers. We can still be friends. We are that crazy family… the one that others sometimes speak of as brave when they really mean insane. In case you’re new ’round these parts and aren’t sure if I’m for real about the nutty bit, this post should convince you. Rewind with me to last autumn. We left our home in Freiburg at the beginning of October 2014, and ended up in Arizona just shy of New Year’s Eve. Seems simple, right? Ha – not so fast. Hang on to your hats and follow along on our ride from Germany to Arizona via a dozen other destinations.. with all the madness and mayhem in between! 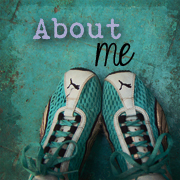 Please note that I am including some links to posts that have not been published yet. If you discover one of these, you can bookmark this post and come back later to read the linked posts, or you can just follow the blog via email (sign up on the right) or Facebook to be notified of all future posts. By the way, if you’re reading these posts for the culture shock aspect, I’ll be honest and admit that recapping the events below is difficult for me. There are certain aspects of living in Freiburg that I miss somethin’ fierce, and I get a bit choked up when I dwell on certain memories for too long. So keep in mind that this adventure is two parts insane, one part pain. Moving is never easy, and moving from one continent to another just multiplies the trouble. The ins and outs of our move is beyond the scope of this post, but I will briefly mention that we shipped most of our things to the US via DHL. Because of this, we did not have to schlep ten, fifty-pound checked suitcases and three children. Just the three kids, they’re non-negotiable. Testing out the new headphone splitter and learning to share one small DVD player. Instead, all five of us all had backpacks and carry-on suitcases. Additionally, we took two gigantic checked bags and a car seat bag. If my math is right, that’s 13 pieces of luggage. Hey, I never said I’m a pro at moving light – just packing light. We bid Freiburg farewell and boarded a train to Leipzig. When we changed trains in Frankfurt, and Alpha and I literally ran to Chipotle in the rain to fetch one last German burrito. While there, we bumped into old friends from the US I haven’t seen in over ten years, also getting their burrito fix. Super fun, and super random. It’s a small (Mexican food) world, indeed. In Leipzig, Doc Sci attended one last conference for his post-doc while I had a fun meet-up and playdate with a blog reader (hi, Rose!). I also took the boys to Dresden… by myself. After three days in the City of Heroes (Stadt der Helden), we flew to Istanbul on Turkish Airlines. Turkish offered the cheapest fare, and it actually turned out to be even less expensive to stay in Istanbul for 3 days on a stopover rather than going straight to the US. We experienced three intense days in Istanbul, soaking up as much as we could of the local flavor and Turkish culture. 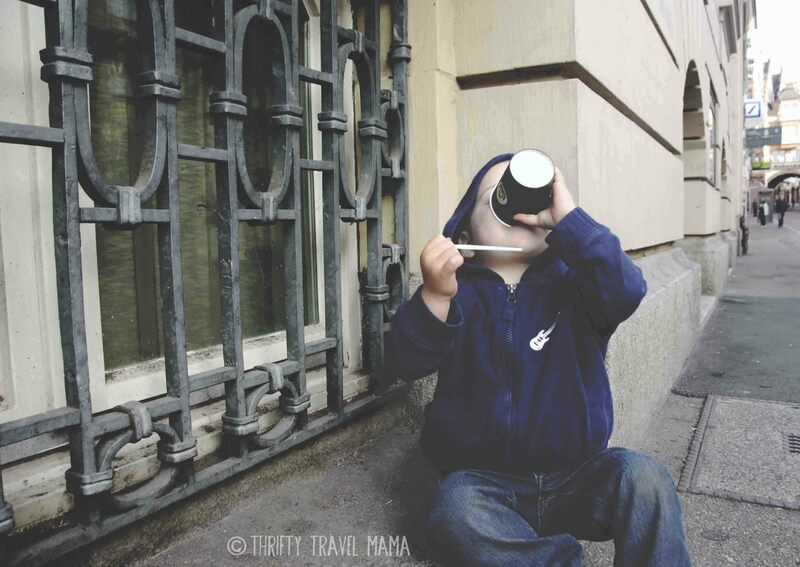 Stay tuned for a budget-friendly “Istanbul with Kids” series! Our first stop in the US was Washington Dulles to visit family. The boys enjoyed a weekend running crazy with the cousins. 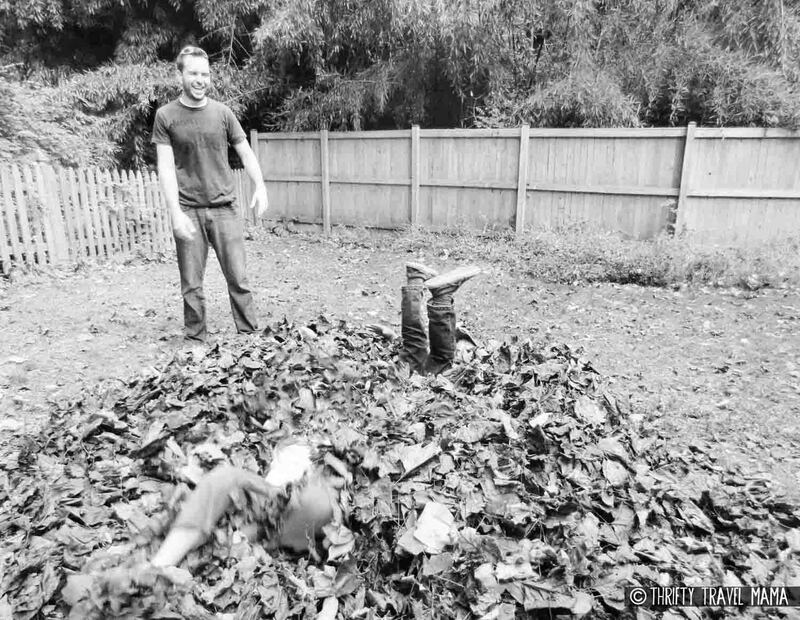 All five kids took advantage of a favorite autumn pastime – jumping in gigantic piles of leaves. We then flew to Orlando to reunited with friends, boxes shipped from Germany, and our car. The last time we drove our car, Charlie was in an infant seat. Now, we have three lanky boys, all in forward-facing car seats. We shoved, pulled, squished, and prayed that three car seats would fit in the back row… of our Honda Civic. In the end, we managed – but just barely. Good thing, too, because this car was to be our home for the next two months. During our time in Orlando, Doc Sci started applying for jobs. We took turns hanging out with the kids and searching for open positions. At night, we both researched universities, cities, companies; we emailed out CVs and cover letters. We dreamed, and we prayed. Just before Thanksgiving, we road-tripped up to Nashville for a change of scenery. We set up camp at Grandma’s house, hung out with friends and family in Music City, and applied for more jobs. It was during our stay in Tennessee that Doc Sci had a phone interview with the university that eventually hired him. But, we didn’t know that at the time, so after two weeks, we then set our sights on the Big D.
One of our Freiburg friends is from the Dallas area (hi, Cheril! ), and her parents were up for letting five dazed and confused ex-expat strangers take over half of their house. Generous souls! We drove from Nashville to Dallas, and unpacked the car once again. More fabulous reunions with friends in the heart of Texas, employment meetings and emails, spelling tests, and math worksheets. This is beginning to be a repetitive story, eh? Somewhere in the middle of the Metroplex, we got the call that a university in Arizona wanted to offer Doc Sci a visiting professor position for the spring semester. Great news – except for one thing. The job started in less than one month. Should we say accept the position? Should we move for a job that was not guaranteed for more than four months? Beyond the philosophical, we also faced a physical dilemma. We stood, at that moment, halfway in between the Arizona job and our stored possessions in Florida. Should we attempt to rent something furnished and run the risk of having to go back to Florida if the job turned out to be permanent? Or, should we go get our things in Florida now? To complicate things further, Doc Sci had set up an in-person meeting in Atlanta for two days later. What did we do? Why, we packed up the kids and drove to Atlanta, of course! One more interview and less than twenty four hours in Atlanta later, we were zooming down I-75 on the way to Orlando again. We were positively sick of being on the road, but we needed those four hundred and fifty miles to discuss whether or not we would move to Arizona. Ultimately, we said yes. And, we took our stuff. Just shy of two weeks after that major decision, we emptied our storage unit, packed a truck, and said goodbye to Orlando. Over the next week, we logged a minimum of eight hours of solid driving each day – not including breaks – to make it to Arizona as soon as possible. We needed to have at least one week to move into a house and prepare for Doc Sci to teach (for the very first time, I might add). I drove our car with the three boys in the backseat, and Doc Sci manhandled the moving truck. If there’s such thing as an ideal road trip, this was the exact opposite. We encountered some of the most intense rain I have ever driven through, a hail storm while on the “stilts” of I-10 in Louisiana with no place to pull over, snow in Texas, and ice in New Mexico. I had done my best before we left to buy new DVDs, arrange little goody bags, dollar store toys.. you know, all those cutesy things you see on Pinterest. But, after a couple thousand miles and sitting ALL DAY LONG for days on end, things got pretty frazzled in the back seat (okay, in the front seat, too). Hey, at least no one threw up. The one bright spot was spending Christmas Eve and Day with our new friends in Dallas (remember those nice people that let perfect strangers take over half of their home?) and the rest of their family. We’ll always remember 2014 as the Christmas where we literally could not uphold any traditions (no Adventskranz, Adventskalendar, cookie swaps, or gingerbread) and barely managed to fill the stockings. Instead, we received the fabulous gifts of generosity and hospitality from strangers turned friends. Humbling, indeed. 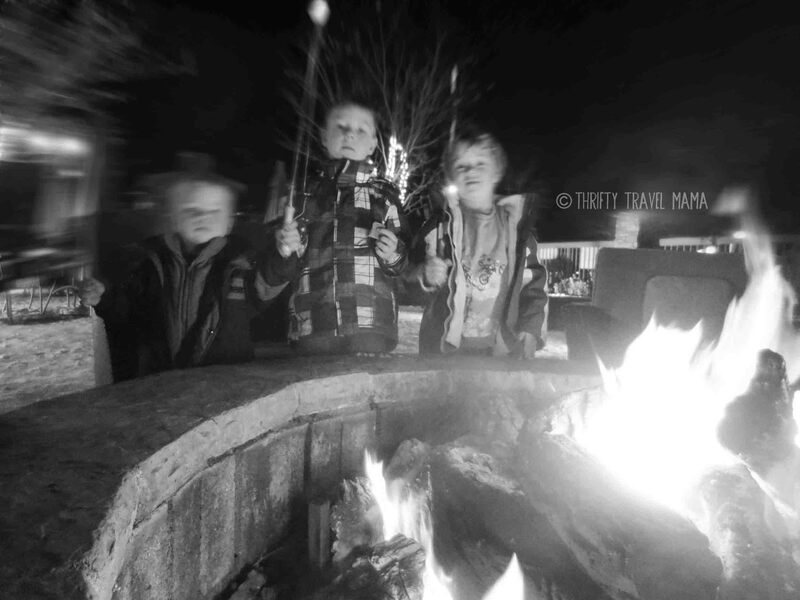 We rang in the new year at a hotel in Arizona, roasting marshmallows in the fake fire pit outside. Hey, it could be worse. We had survived our road trip, and we were all healthy and alive! Unfortunately, the house we rented wasn’t ready for us to move in until after Doc Sci started working. In the meantime, I shopped with the kids in the mornings, looking for basic furniture for our new home. When we moved to Germany, we gave nearly everything away because it didn’t make financial sense to store it. In the afternoons, the boys did school while Charlie napped. When Doc Sci came home from work, I left to do more shopping and research. On moving day, we pulled up to our new house and found that all the vendors (painters, cleaners, etc.) had packed down the snow in the driveway, leaving us a housewarming present of a two-inch thick slab of solid ice on which to unload our things. A kind neighbor lent us a snow shovel; the boys chipped away at the ice while Doc Sci and I tried not to break any bones. 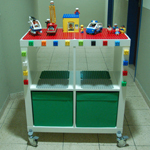 Once we were moved in, Doc Sci had to turn his attention back to the paying customers – students – leaving me to assemble the furniture, unpack, and set up our home. After sleeping in twenty different beds in a mere two months, we felt like guests in our new-ish house with brand new furniture. The scars of pro-hoboing must be deep because even after six months here, that feeling has just started to subside. Since the job in Arizona was only temporary, I wasn’t exactly motivated to really move in – you know, hang pictures, decorate, make things “for real.” Plus, it was hard doing everything alone. Doc Sci left early in the morning, worked all day, came home for dinner, and then worked again until nearly midnight almost every night in an effort to stay at least one class ahead of the students. I know this is reality for many families, but it was new to me and just.one.more. adjustment coupled with all the other changes. The bright spot in all of this was that the two of us did not grow apart, though that would have been rather easy to do. We both worked hard in different ways, and we respected each other’s efforts. We asked for help when we absolutely needed it, and gave as much as we could to each other in that time. Looking back, I do not know how we made it through apart from the grace of God. Our kids managed to overlook our flawed and stressful selves. Although they moaned and complained here and there about having to do school, I think they were just so relieved to not be hobos anymore. I love to travel, but those months were an adventure I surely do not want to experience ever again. Things are looking up for us now, maybe because it is summer break or because we have made some friends here and we don’t have any more boxes to unpack. I do still have more pictures to hang and projects I think would make this place more like home. But, we’re getting there. I can feel it. Inch by inch, centimeter by centimeter, minute by minute, day by day. We’re making it. How about you? Have you ever had to move from place to place, looking for a job? Has a new location shifted your life in a big way?